As you can imagine there have been quite a few designs and colourways over the years. 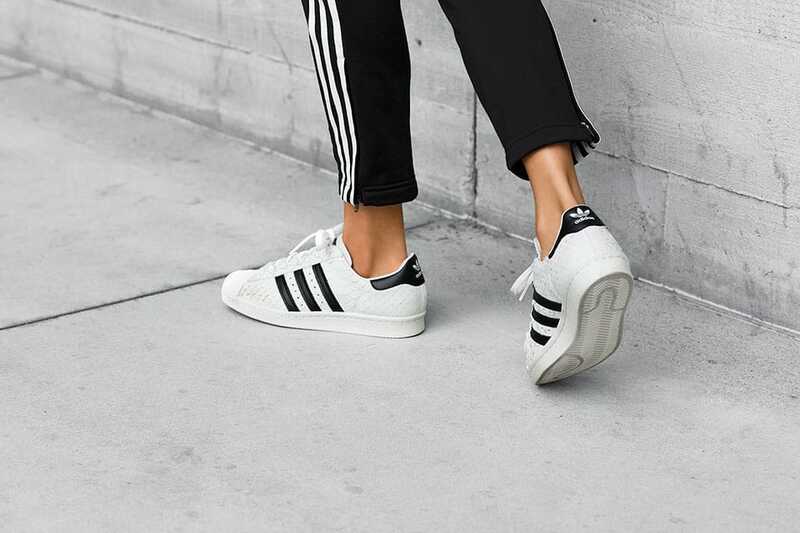 The womens adidas Superstars have been just as popular as the mens. (And don't forget the adidas Superstar Kids range.) To pay homage to the great adidas shoe we are going look back at the superstar releases. The shoe has seen some very different designs since those first athletic models. I know some people cringe at the thought of adidas creating so many iterations of a classic but let's get real. adidas is a business with share holders and a board to answer to. Without new partnerships, sponsorships and designs, adidas would quick disappear from the radar. When buying adidas Superstars you can either buy new from retailers like adidas or try and pick up some vintage adidas Superstars. Searching for deadstock and limited releases can be tough but not impossible. 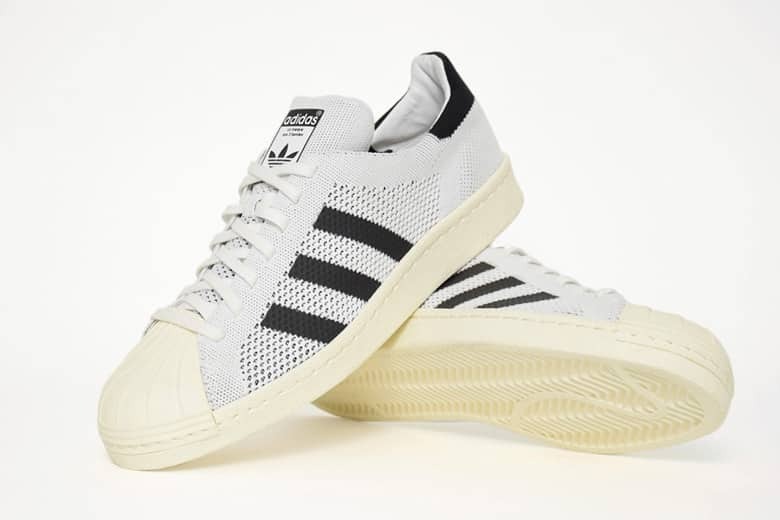 Hopefully this list of adidas Superstar releases will help in your quest to find your perfect pair, whether they are a new release or an older model. 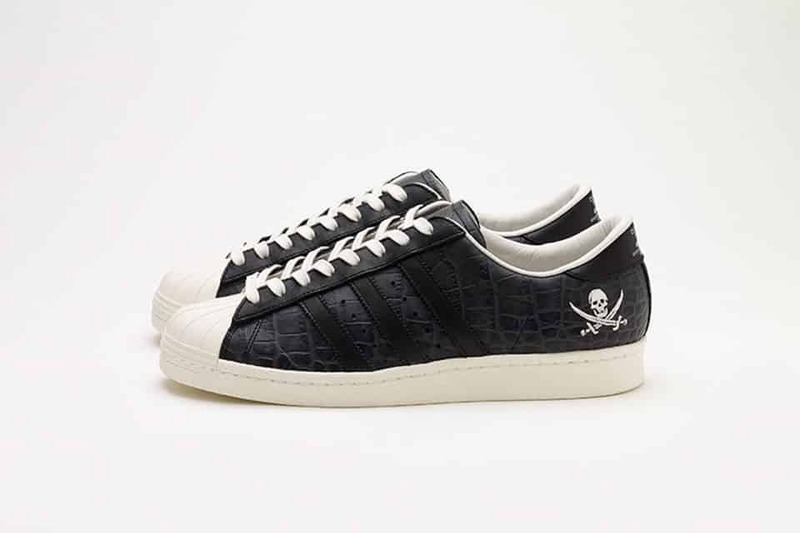 At the end of December 2007 adidas released the adidas Superstar CLR Pack. The CLR stood for clear and featured a clear gum sole, clear gum shell toe and clear 3 stripes down the side. The leather upper was perforated and came in either a white or black. There were a couple of later releases of the CLR but that time round it was only the sole that was clear. 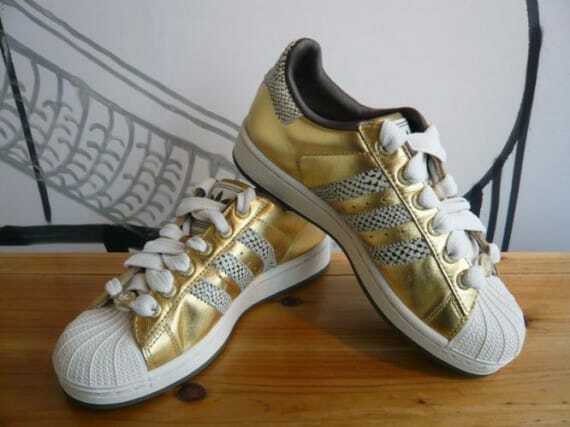 Early 2008 adidas released their first gold and silver Superstar. Around this time there were a lot of rival companies releasing similar shiny colourways. 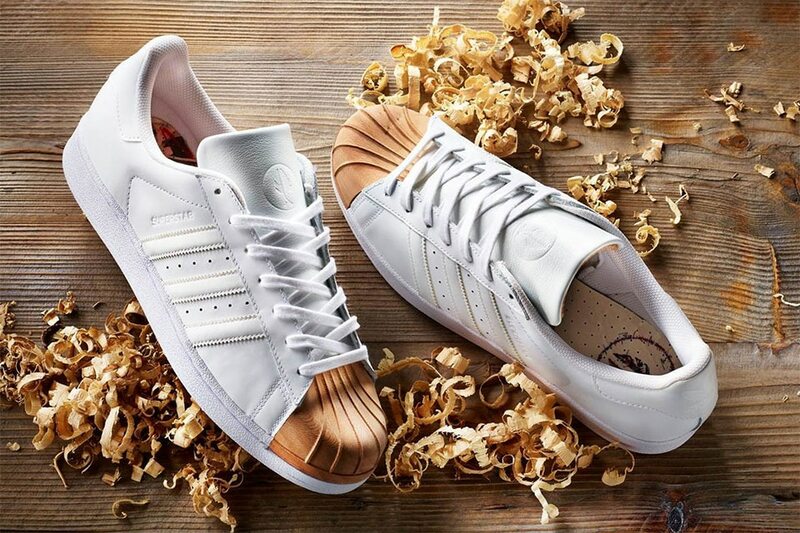 Adidas decided on a silver model with a turquoise shell and a gold model with a white shell. It wasn’t the last time we would see the Superstar decorated in these colours. 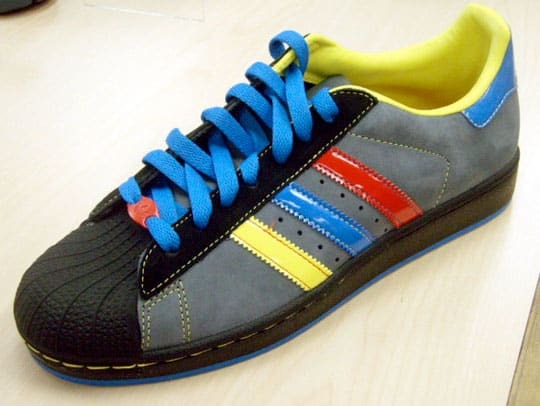 The adidas Lego Pack was released early 2008 and consisted of an extremely vibrant Superstar and a pair of ZX750’s. The upper was a basic grey with a black shell toe. It was the colours used for the shoes stripes and laces that provided the lego look. 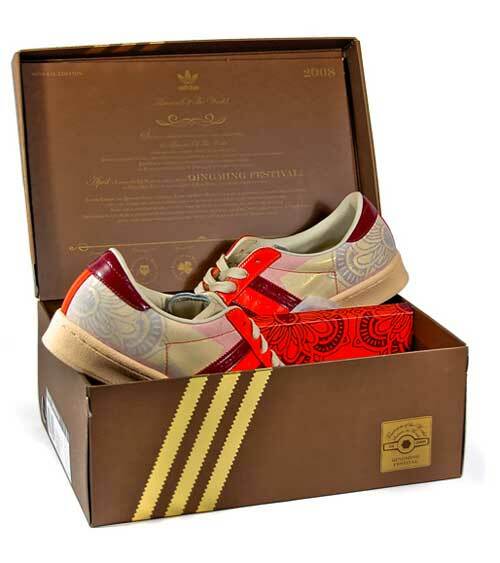 The adidas “Qing Ming Festival” Superstar was a premium release in April 2008 as part of the “Flavours of the World” series. 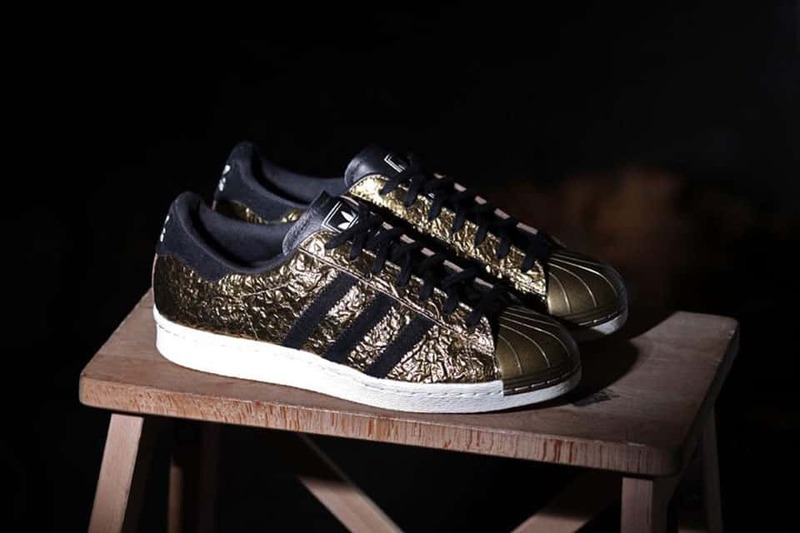 This Superstar was inspired by the Chinese Qing Ming Festival where tributes are made to ancestors by flying kites. Adidas were very particular with the design and giving the shoe a true Chinese feel. There is a flower pattern throughout the shoe with a gold twill. These little gems are a real collectors delight. 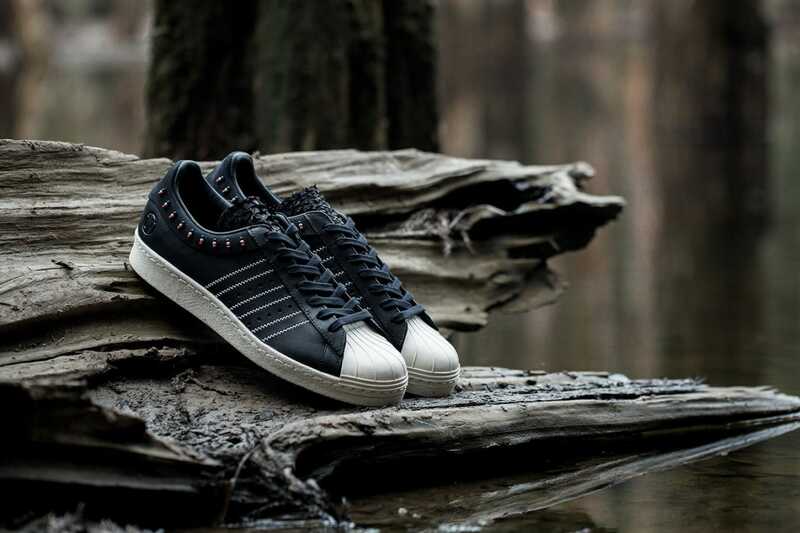 In late 2008 adidas teamed up with New York store owner David Zaken to produce a Superstar that was all black as part of the Black Tie Project. 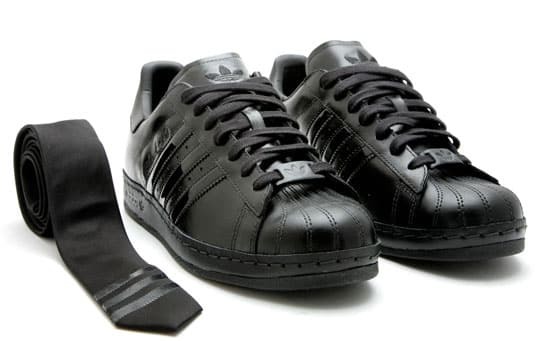 Around that time there was a very dressy fashion so adidas and David Z decided to give the Superstar a black tie make over with the adidas Superstar x David Z “Black Tie”. Only 400 of this premium model were released. The standout feature on this shoe was the premium embroidered leather that was used instead of rubber on the infamous shell toe. 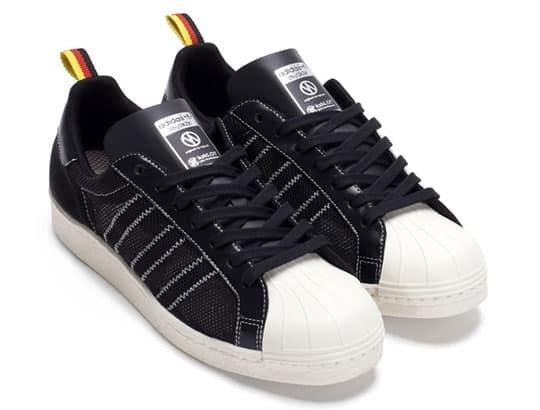 In 2008 owner and designer of Neighbourhood, Shinsuke Takizawa teamed up with adidas to produce the adidas Shinsuke Takizawa Superstar 80s. Only a few were made so if you do stumble upon a pair then you might be in look. 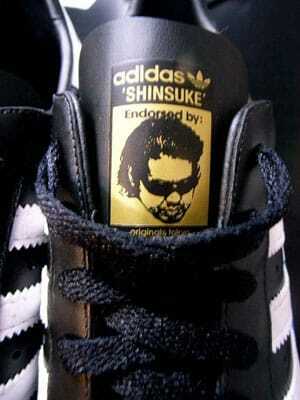 The shoe contains a gold image of Shinsuke on the tongue. When 4 of the leading Consortium partners collaborate on one shoe then you know we are all in for a treat. Well that’s exactly what happened in early 2009 to celebrate adidas’s 60th anniversary. 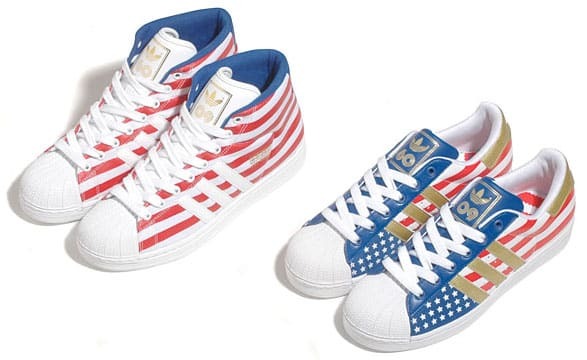 At the end of 2009 adidas released the Stars and Stripes pack that included a pair of Superstars and a pair of Pro Models kitted out in stars and stripes. On the tongue there was a number 60 to reference the Superstars 60th Anniversary. The shoes were sold through sneaker store Milk. 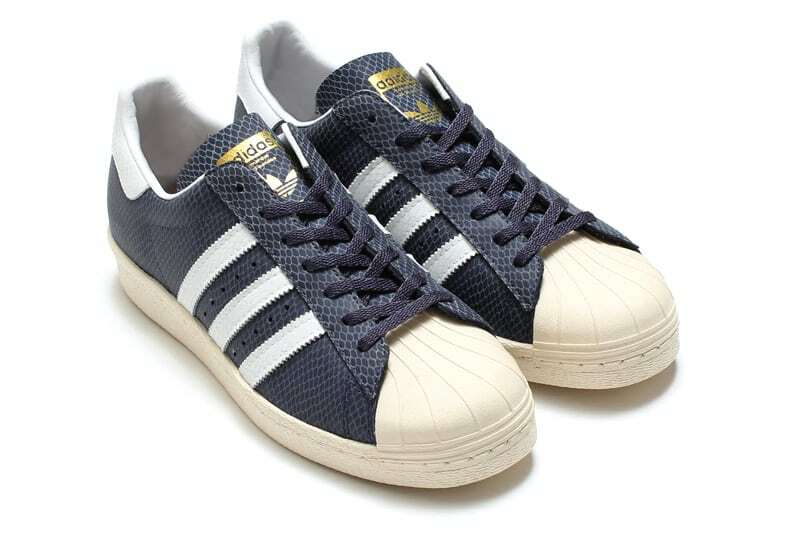 Mid 2009 adidas collaborated with XLarge Japanese branch to produce the Superstar XLarge. The design mixed lime green, purple, pink and blue to produce a colourway never seen before. 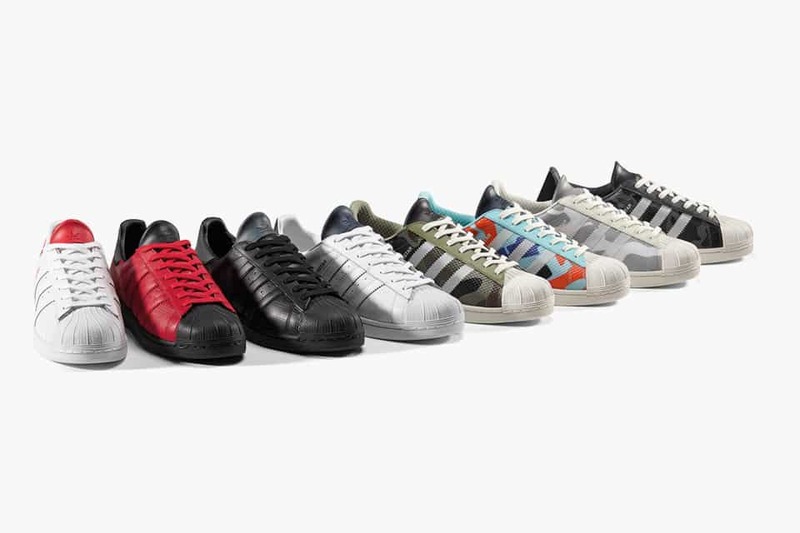 In Autumn 2009 adidas opted for a super attention seeking superstar with the release of the Color Pack.. There were two multicolor options set in a black or white base. 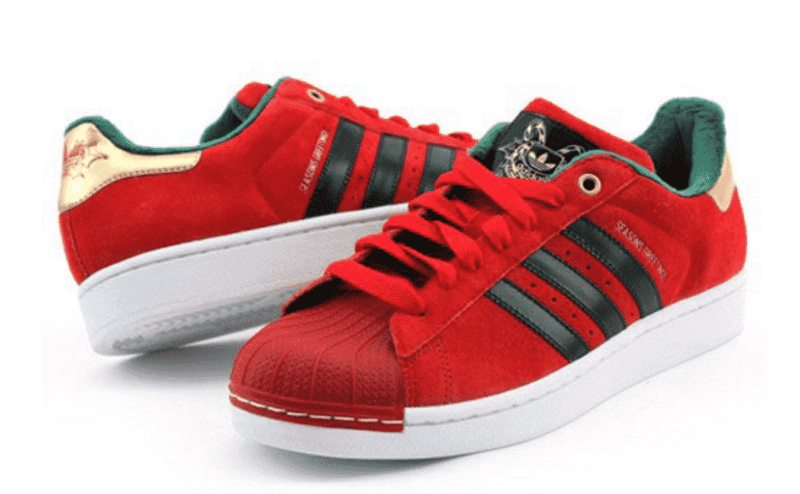 The end of 2009 saw adidas team up with Redman to add a twist to pair of Superstars and the Forum mid. 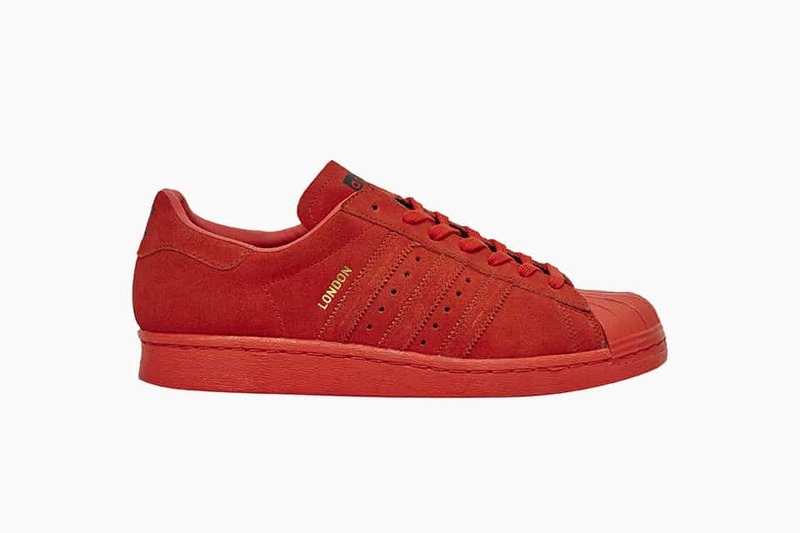 The Superstar used a red suede material for the upper with some careful crafted black detail. 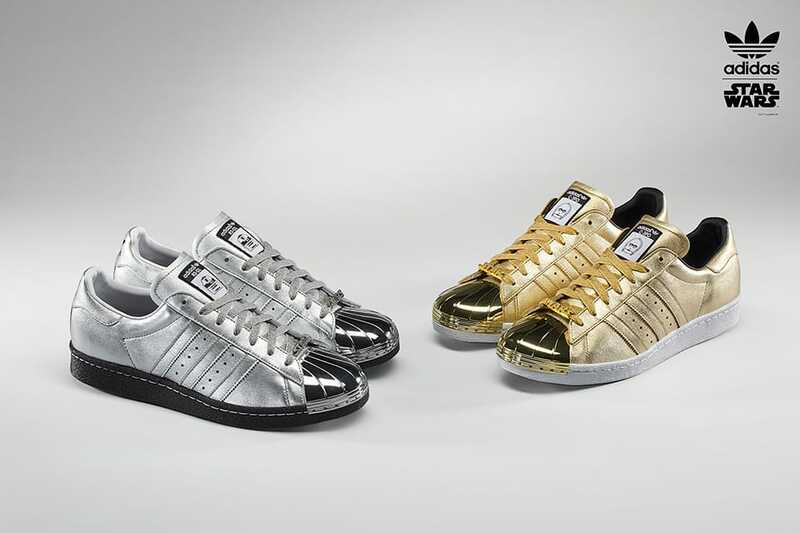 adidas opted to celebrate Christmas 2009 by restyling the Superstar with some festive cheer. The Superstar came in a holiday red and there was also a Stan Smith release in green. Both shoes also had some Christmas decorating on the heel and the tongue. If you do try and pick up a pair of these vintage classics then make sure you also get the Qee toy keychain dressed up as Santa that also came with the shoe. 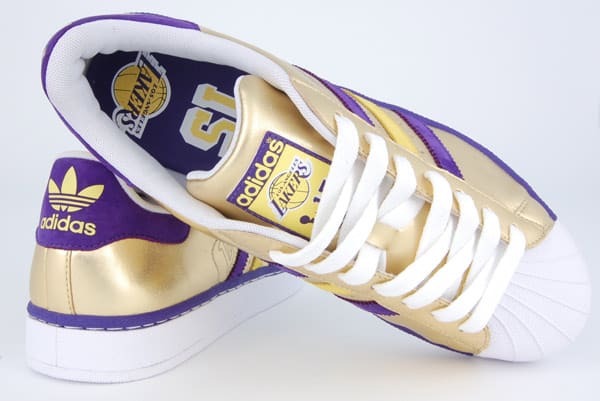 At the start of the 2009-2010 basketball season adidas released a special LA Lakers Superstar to acknowledge their 15th NBA Championship win. The Superstar had metallic gold and purple. For Valentines 2010 adidas released the Valentine’s Day Pack that included 2 pairs of Superstars alongside a pair of Nizas Hi and Lo. One of the uppers from the Superstars was red and the other one blue. 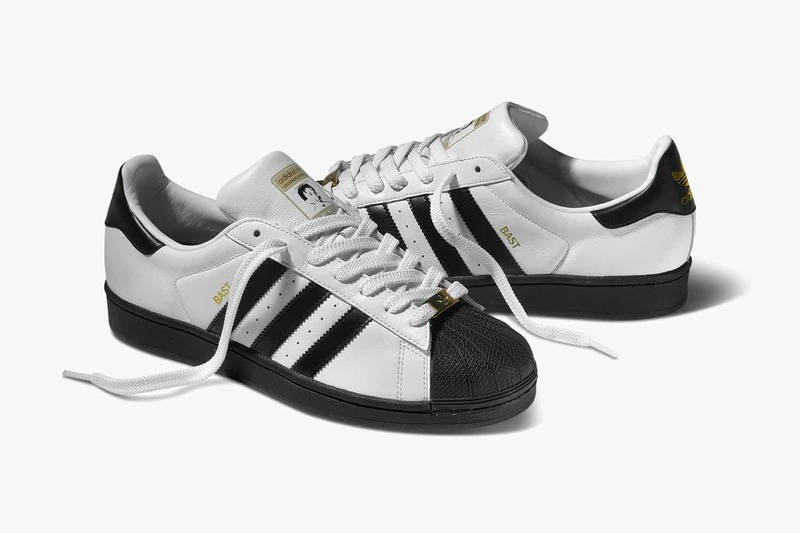 Mid 2010 adidas released the kzkLOT Superstar 80 as part of its originals by originals range. The Superstar 80 was a collaboration between Kazuki and CLOT. 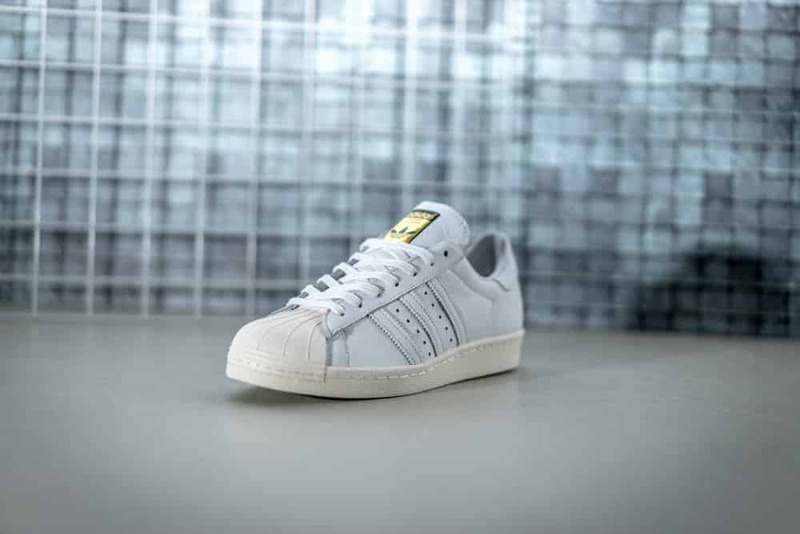 This stunning Superstar model came with a black mesh upper with white contrasting stitching and sole. adidas were feeling the summer vibe back in 2010 when they released the Beach Pack. It consisted of the forum mid, the Stan Smith and of course the Superstar. The design of all 3 models used a white leather and a colourful mesh. A great combination of contrasting materials made this release a popular choice that year. 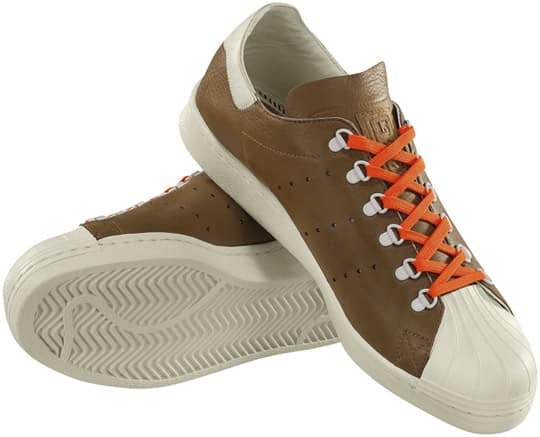 Released in November 2010 the Burton Snowboards came with a brown leather upper, stand out orange laces and metal rivets. A classic release that will be worth a bit if you happen to own a pair. 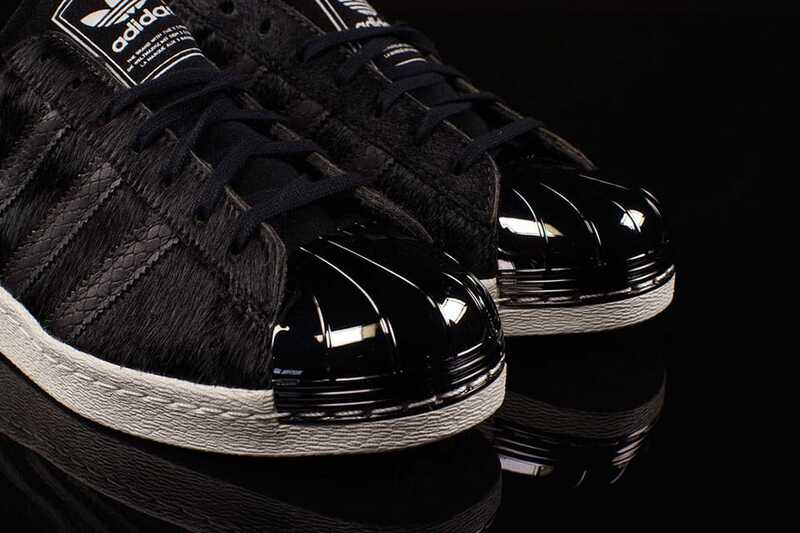 One for the collectors from 2010 is the CLOT x Star Wars x adidas “Darksidestars” Superstar. The stand out feature of the shoe was the sole that had an image of the dark lord. Next to the 3 stripes read the words “Darksidestar”. The atmos x was released at the end of 2010 with the stand out feature being the glow in the dark upper. When not in the dark the upper was a burgundy snake skin. 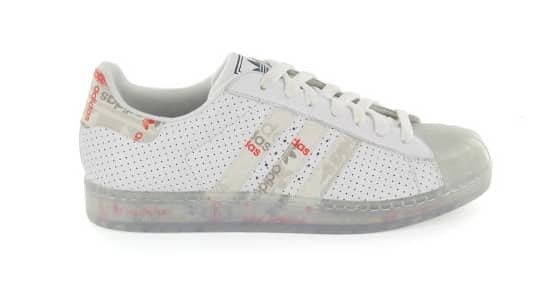 As part of the David Beckham Spring/Summer collection in 2011 adidas released a version of the Superstar. The DB saddle superstar was very different to the standard Superstar design. The Porter/adidas originals collaboration created a classic Superstar design that used a zip feature. The bright orange lining made this shoe stand out from other Superstar designs, along with the black nylon upper. 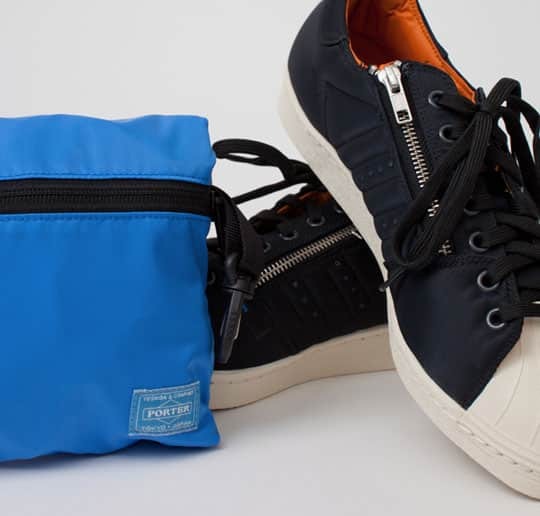 To top of this design adidas gave the shoe a nice sporty shoe bag. 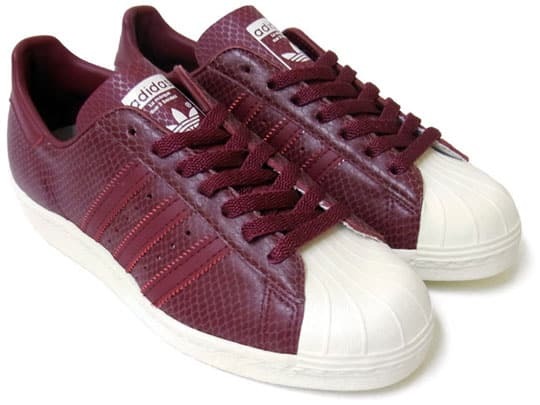 This black croc version of the Superstar is a followup to the burgundy glow in the dark snakeskin mentioned above. This black simple snake skin upper also offers the glow in the dark feature which is hard to believe when looking at the clean style in the daylight. A beautiful classic release. 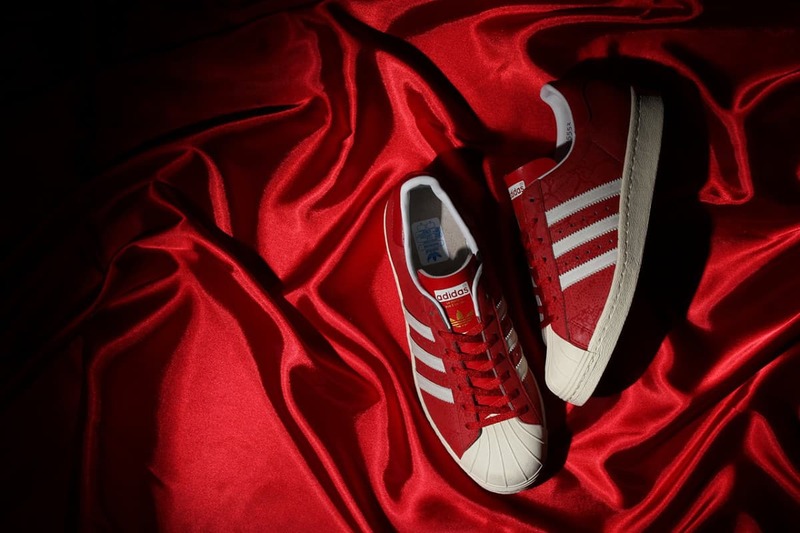 Another Superstar design by Kazuki in collaboration with Hong Kongs Clot was the adidas Originals by Originals kzkLOT Superstar 80s. In contrast to the previous black design, this shoe was a more traditional white. The upper was one of the first Superstars to feature a mesh design for extra breathability - something that is much more common these days. Another huge collaboration around mid 2011 witnessed the coming together of Beauty & Youth, Bedwin and Undefeated to produce the adidas Superstar Vin “BBU”. 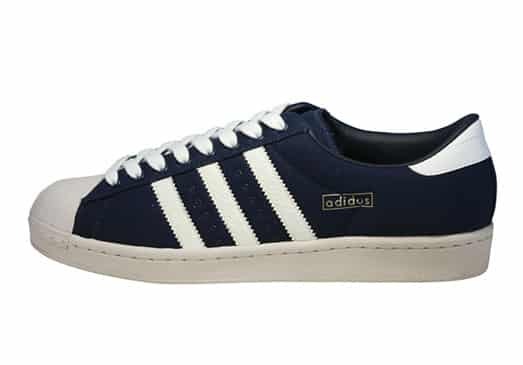 This was a classic Superstar with a navy upper and white stripes. Bape is a German sneaker company that release some of the most hyped and talked about sneakers. It was just the same in 2011 as it is now. 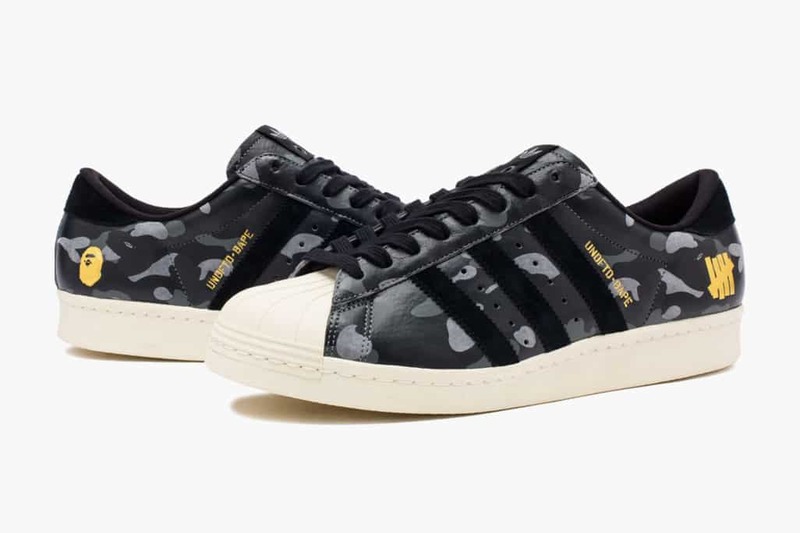 The BAPE x adidas Originals ‘B-Sides’ Superstar 80s. This release had a suede upper with an off-white colour which has becoming a sought after look around this time. The shoe was finished off with navy leather stripes and back. 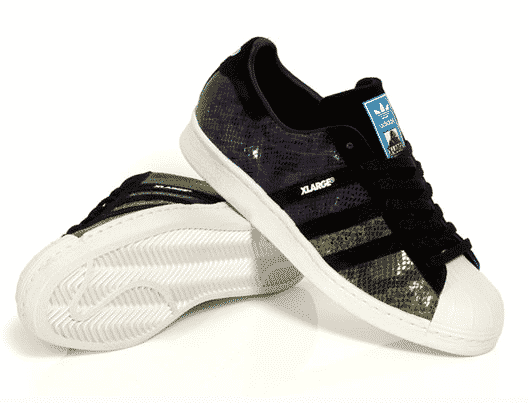 One of the most sought after Superstar releases is the RUN DMC x adidas Superstar 80s ‘My adidas’. 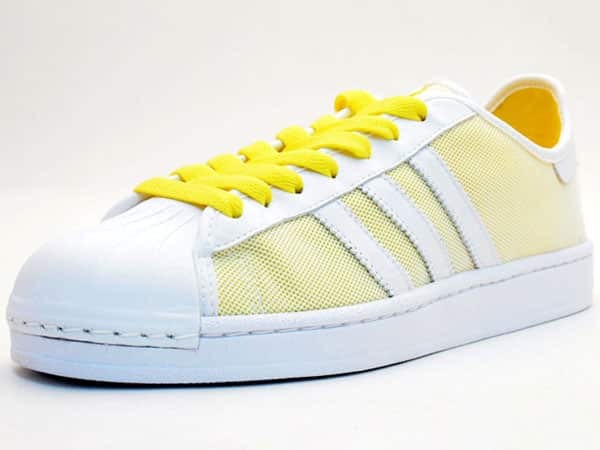 The shoe was released in 2011 to celebrate 25 years since the song “my adidas”. Throughout the shoe there are a number of tributes including the gold rope chain and the year 1986 embroidered on the back. The sneaker was a very limited release and is in high demand today. To celebrate the adidas Originals Tokyo stores 10th anniversary adidas released the adidas Originals 10th Anniversary “Made For” Tokyo Superstar 80s. The shoes had a strong leather upper with its stand out feature being the soft suede sockliner. Only 150 were made and each pair was numbered. If you have a pair of these beauties then make sure they are in a safe place. Kinetics is a Japanese stockist who teamed up with adidas to work on the animal pack. 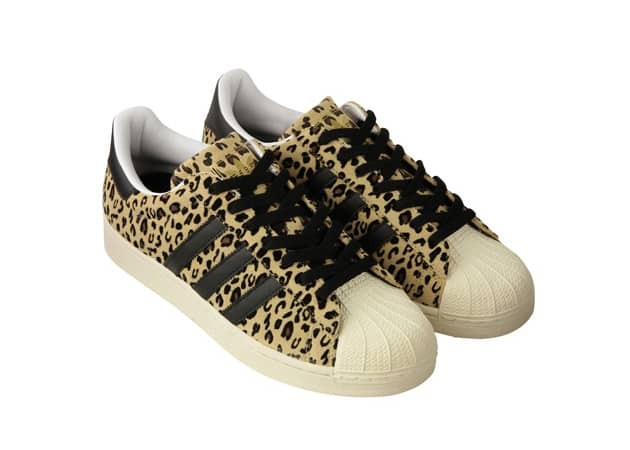 One of the stand out items of the pack was the leopard fur Superstar 80s with Snakeskin stripes. This shoe was released at the beginning of 2012. For the Chinese New Year, adidas released a white and a green pair of Superstar 80s. The upper of the shoe was constructed to give a snake-skin look. Green jades were placed on the shoe to accentuate the Chinese look. Atmos and adidas came together yet again in mid 2012 to produce yet another Superstar 80 design. Once again using a snakeskin look with the signature glow in the dark upper. This was the 5th version of the collaboration and still looked good. It was inevitable in 2012 that there would be an official snakeskin pack due to the number of snakeskin releases over the previous 12 months. This pack consisted of Campus 80s and Superstar 80s. 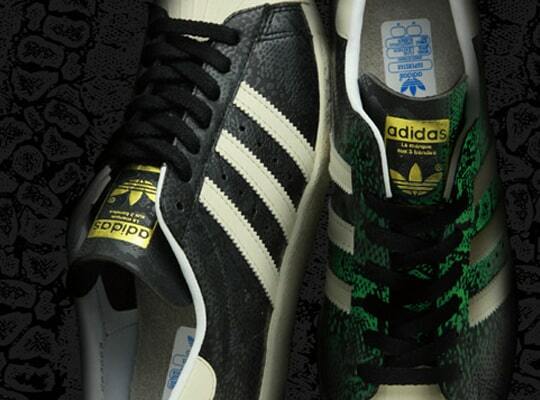 Adidas didn’t stop at the Snakeskin pack in 2012 as they decided to back it up with the Animal Patterns Pack. 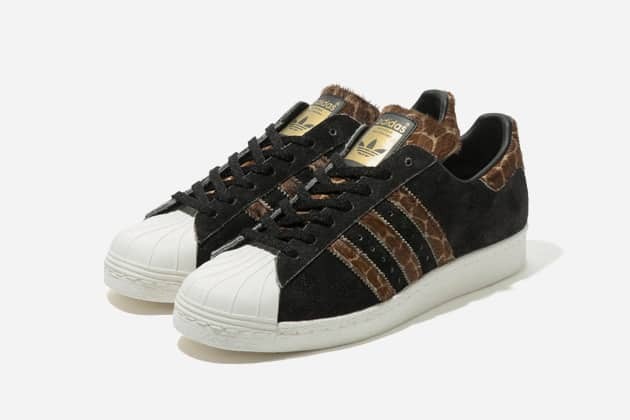 This release was a ABC-Mart Exclusive and offered 3 colourways of the Superstar in either a zebra or leopard pattern. This was a premium release in late 2012. Adidas teamed up with Japanese brand Vanquish to produce a lovely pair of Superstar 80s with leopard lining and metal studs. The 80s were part of a bigger release of merchandise. This was the second release to the one above from Vanquish. This time they teamed up with retailer Beauty & Youth. Once again this was a premium release that used leather for the shoes upper. The other stand out feature other than the classy beige was the thin laces. In collaboration with Japanese retailer Mita Sneakers adidas released the Holiday Vintage pack for the holiday season 2012. The pack included Campus 80s, Superstar 80s and the Tobacco. Each pair lived up to its vintage label by offering a number of vintage additions throughout the shoes. 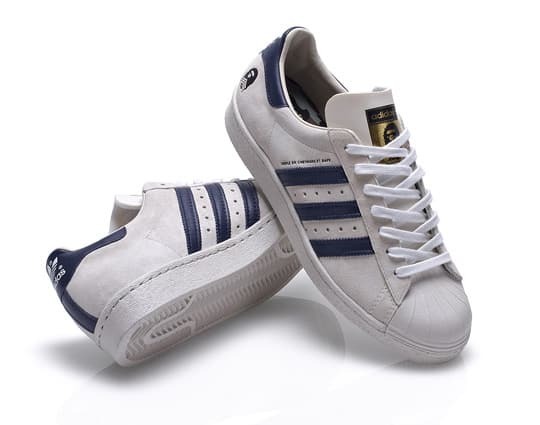 The Superstars used a traditional navy blue with off-white shell toe. 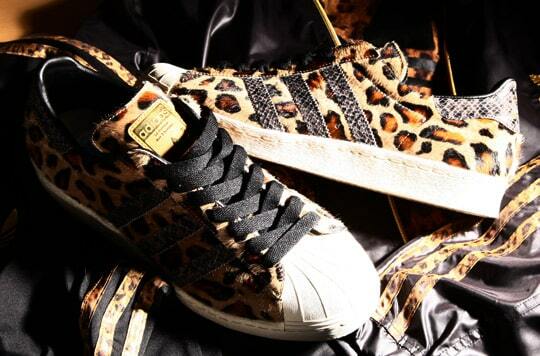 Early 2013 saw adidas team up with XLARGE to release the Giraffe themed Superstar 80s. The giraffe pattern was used on the stripes, the heel and tongue. In Spring/Summer 2013 adidas and atmos cashed in again with a different colourway of the snakeskin, glow in the dark sneaker. This time the iconic leather was offered in a navy blue. Once again this interesting design and feature proved to be very popular once again. Adidas teamed up with designer Juun J from Korea to produce 2 reworks of the adidas Superstar 80s. The first design was a very hightop with strap fasteners and the second design was a contrasting lowcut design. Both styles came in either all white or all black. April 2015 continued to set the scene for a big push of the Superstar. 4 legendary skaters Kareem Campbell, Joey Bast, Drake Jones and Richard Angelides were all asked to design a Superstar under the title “Respect your Roots”. The idea was for the skaters to pay a tribute to a shoe that played an important part as they were learning their trade. Spring Summer 2015 witnessed the release of a very eye-catching Superstar. The upper consisted of a bright white look. The stand out feature of this shoe was the bronze shell-toe that made this show really stand out. 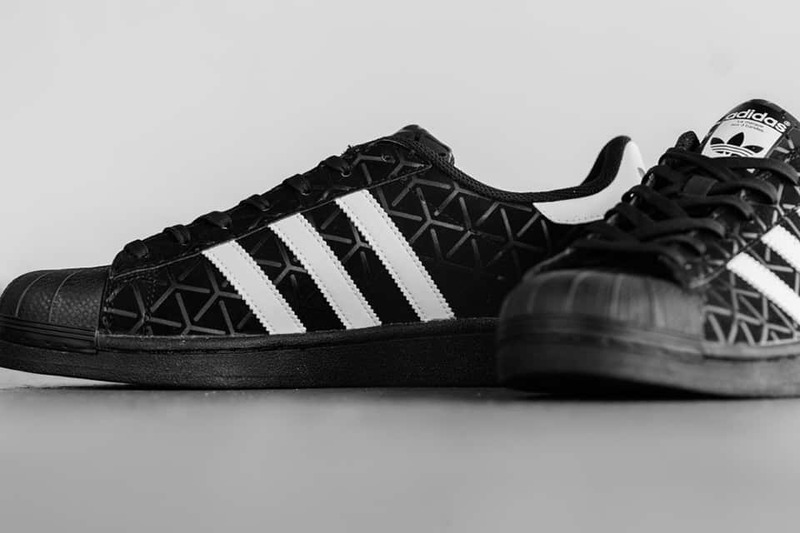 Adidas went for a contemporary look when they released the “Shield” pack. 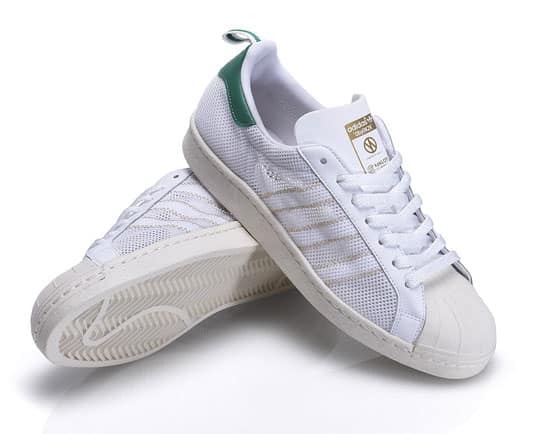 The pack included the Samba and of course the Superstar. The stand out feature with this release was the grid like sides that revealed a canvas underneath. 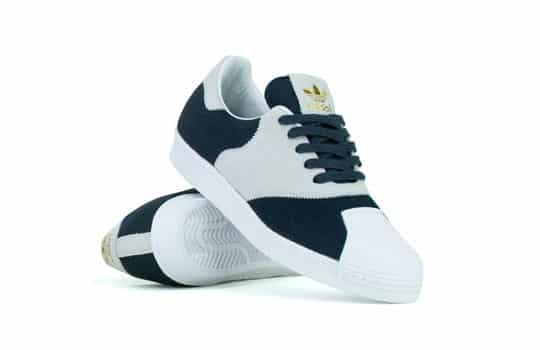 I lovely looking shoe that was available in either black or white in the Superstar and black leather or burgundy suede in the Samba. Here we go again. Adidas and atmos teamed up again at the end of 2014 to release yet another colourway of the popular G-SNK. This time the colour of choice was a bright red and once again featured the classic glow in the dark material on the upper. What made this show so popular was that there was no sign of the glow in the dark in the daylight. The question after this release was whether there would be a ninth release?? 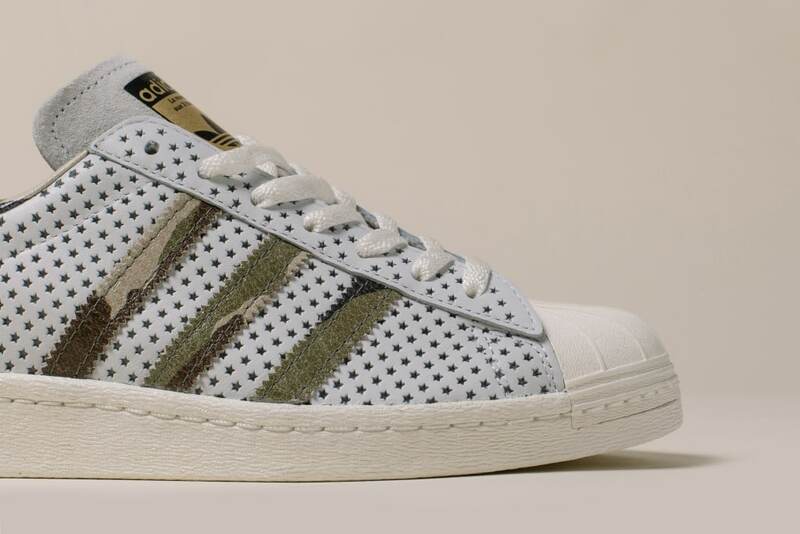 The adidas consortium program decided to pay tribute for the 45th anniversary by releasing a traditional OG design. The shoe was handcrafted in Ateliers Heschung which is the french factory that manufactured adidas shoes in the 70s. This was a real OG with zero branding on the heel tab and classic off-white shell-toe. In 2015 to mark the year of the Superstar, adidas released an authentic OG with all the deluxe trimmings. The upper was made from a premium white leather and there was a gold logo printed on the tongue. The adidas Consortium decided to roll out a tribute to celebrate 10 years since they released 2 popular Superstars back in 2005. One of the shoes was the Superstar X Dassler that of course paid tribute to the man that started the whole adidas thing in the first place. The original x Dassler for 2005 was white with black trimmings but for this 10th anniversary release adidas flipped the colours. 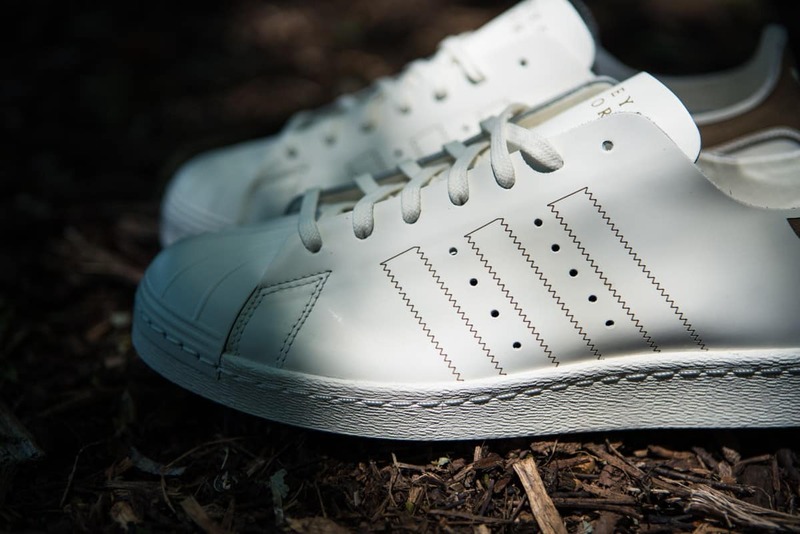 The other part of the duo was the re-release of the adidas X UNDFTD in a clean white leather upper. 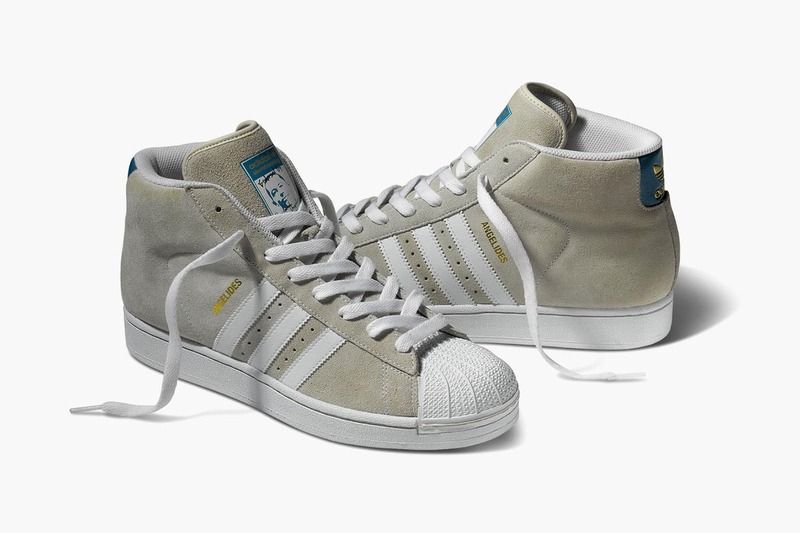 Adidas teamed up with legendary skater Mark Gonzales, otherwise known as The Gonz. The result was a unique Superstar 80s design that offered the owner the chance to decorate the white upper as they want. The Consortium members in the form of Neighborhood & Unions got in on the 10th anniversary act in 2015 and released a duo of shoes that were only available in their respective stores. The Neighborhood release featured a black snakeskin upper with a skull and crossbow imprinted on the heel. The Union release offered a brown tan upper and a Union LA logo on the heel. 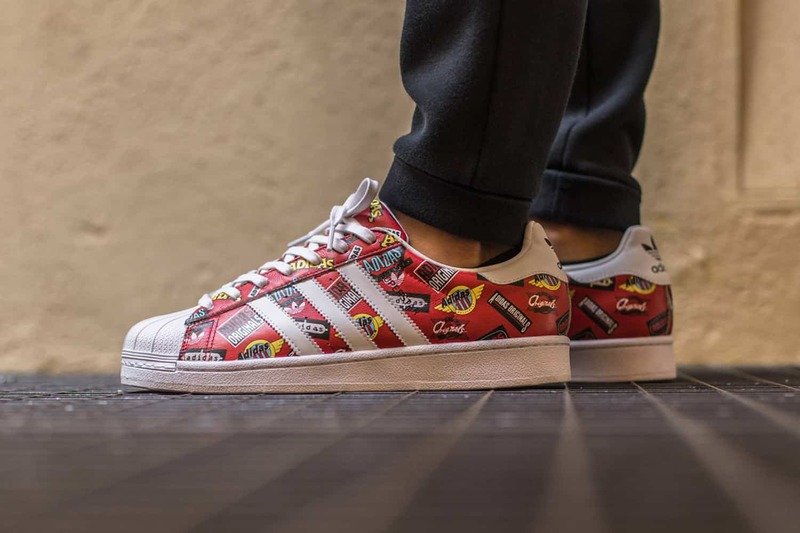 In 2015 Nigo once again showed his passion for streetwear and adidas. This sneaker from Nigo collated numerous adidas logos to form the upper. The shelltoe, sole and laces came in a contrasting bright white. A NIGO classic. 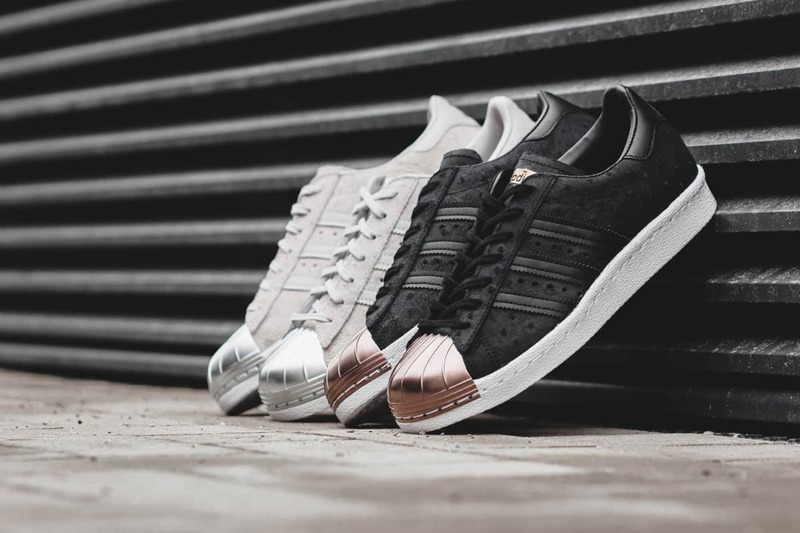 The adidas Camo pack was released to pay tribute to the lasting legacy of the Superstar. There were 2 colourways released which included a white and a timber offering. The standout feature of these shoes was the raised dots on the leather upper. 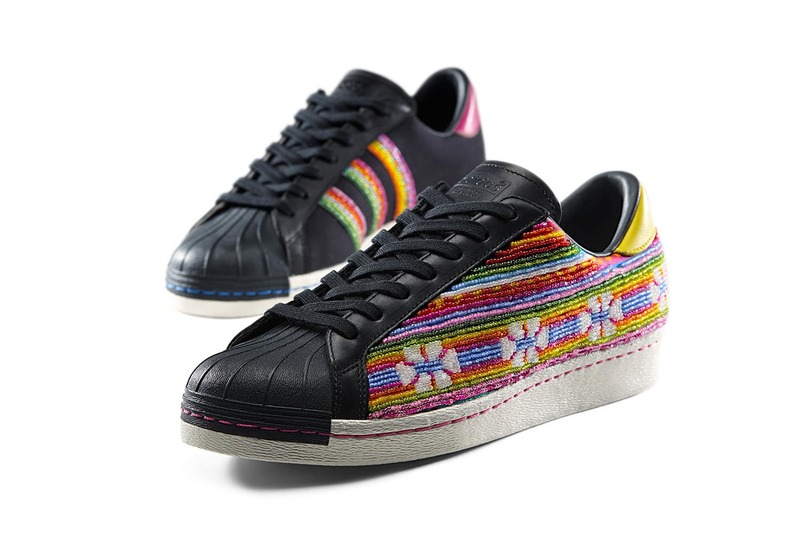 Inspired by Bolivian crafts, Pharrell released a very different pair of Superstar 80s. His design features a handcrafted bright pattern down the side of the shoe and a black top and heel. 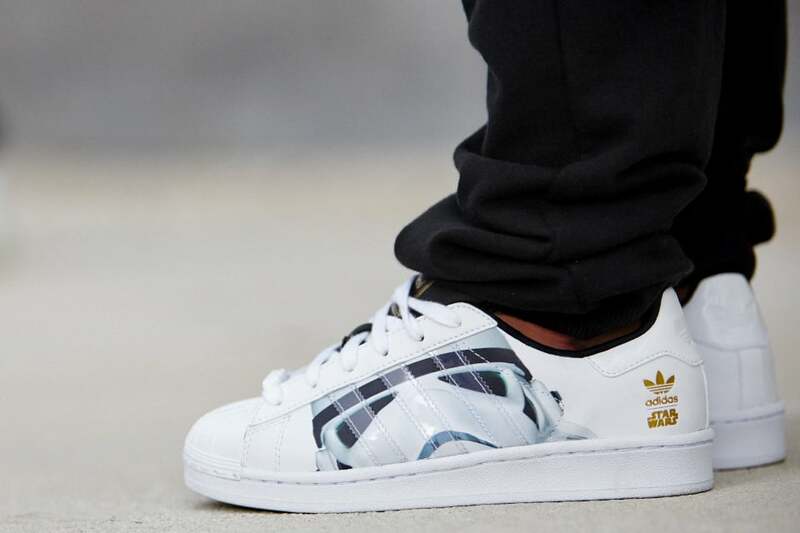 The next Superstar collaboration for 2015 saw adidas team up with Shawn Stussy’s S/DOUBLE moniker. This pair was designed especially for All Star weekend in New York City. The upper consisted of a Indigo/Dark Marine leather which was contrasted against traditional white toe, sole and laces. As part of the Star Wars “Stormtrooper” pack adidas released a Superstar sneaker as part of their kids collection from the pack. 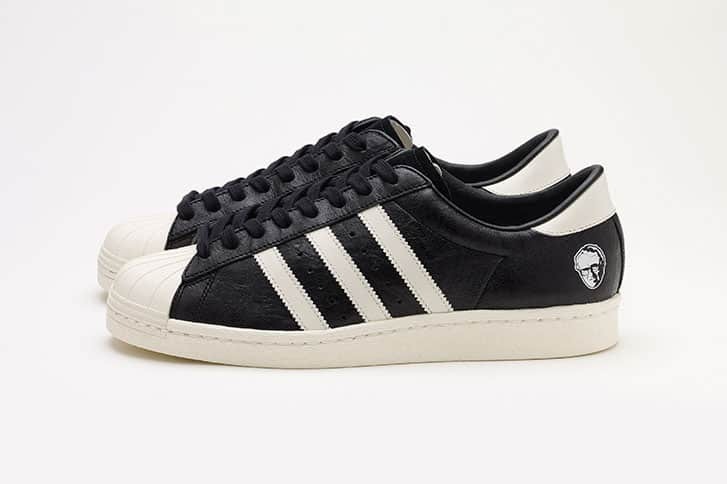 The Superstar features a scary Darth Vader print on a bright white shoe. An absolute must for any kid that loves their Star Wars and adidas. We mentioned one of the camo pack above so here is the full set that released mid 2015. The pack consisted of 8 designs that all had a different take on what camo might mean - not necessarily the traditional camouflage you might expect. Oh my days! The Black Mirror Superstar was not the first time adidas used a hard shelltoe, there was an earlier copper metal toe released a year earlier. This Superstar used pony skin and crocodile skin to give it a very different appearance to that which we are used to. Building on the “Black Mirror” release above adidas’s next move was to extend the metal from just the toe to the full upper. What resulted was a pair of very dressy Superstar 80s. This shoe couldn’t be any different than is OG brother. 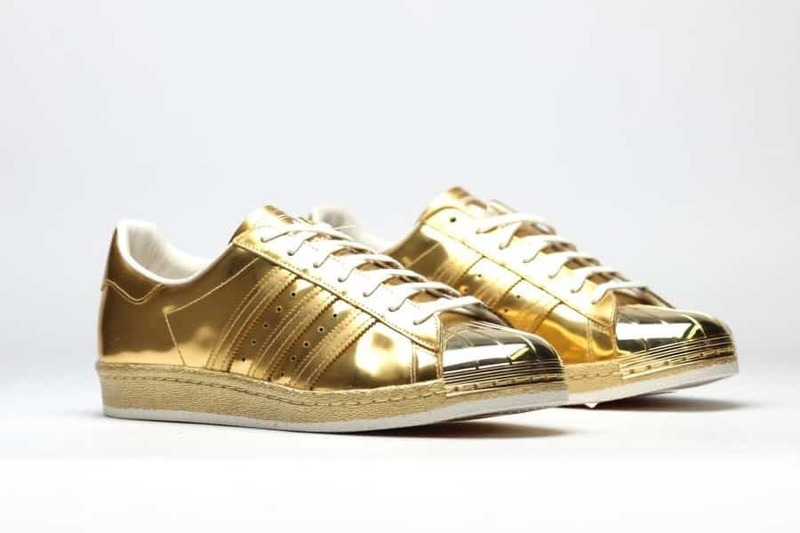 This time adidas released the all gold metallic Superstar 80s in followup to the Metal Gold and Black Mirror above. As the name suggests the shoe was covered from heel to toe in gold with only a white sole to contrast. 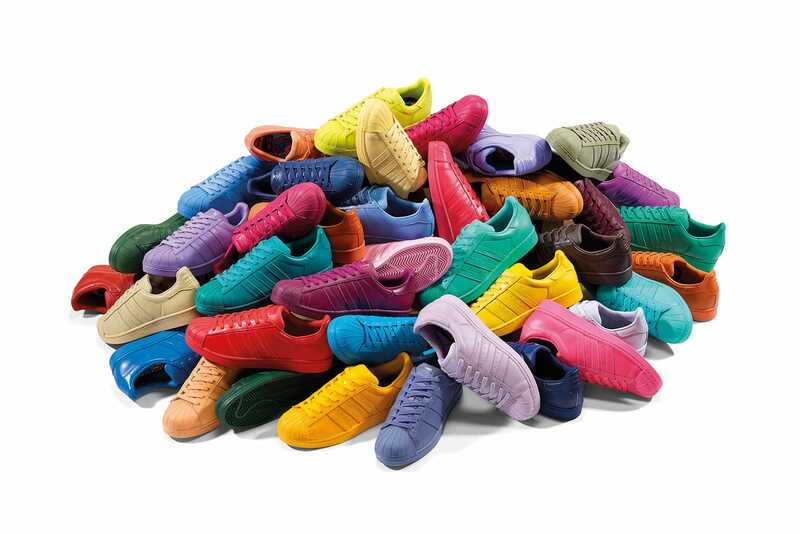 Pharrell’s Supercolor pack offered the Superstar in 50 different colours. The idea was to celebrate diversity in the human race by offering choice and individuality. 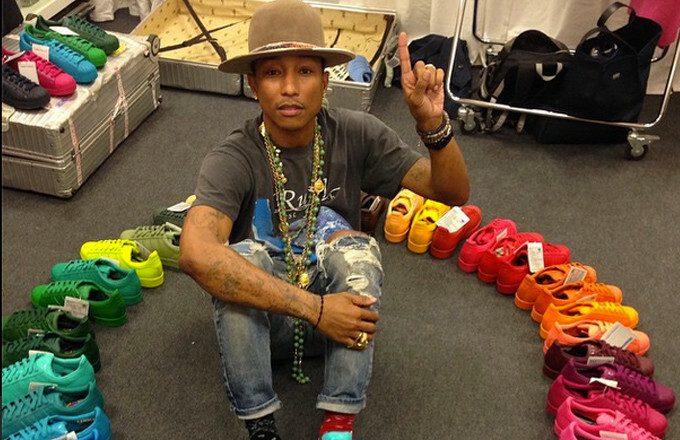 With 50 different colors Pharrell pretty much covered every color of the spectrum. This premium limited release saw adidas team up once again with Yohji Yamamoto. 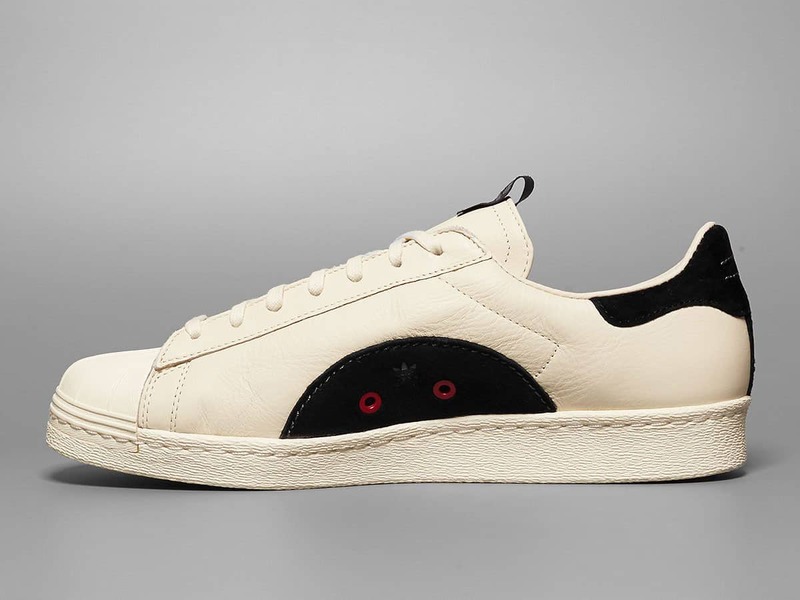 This Superstar low top was made from premium materials, especially the upper that was made from the finest leather. These stylish models were offered in either a shiny red or navy blue and featured Yohji’s signature on the side. 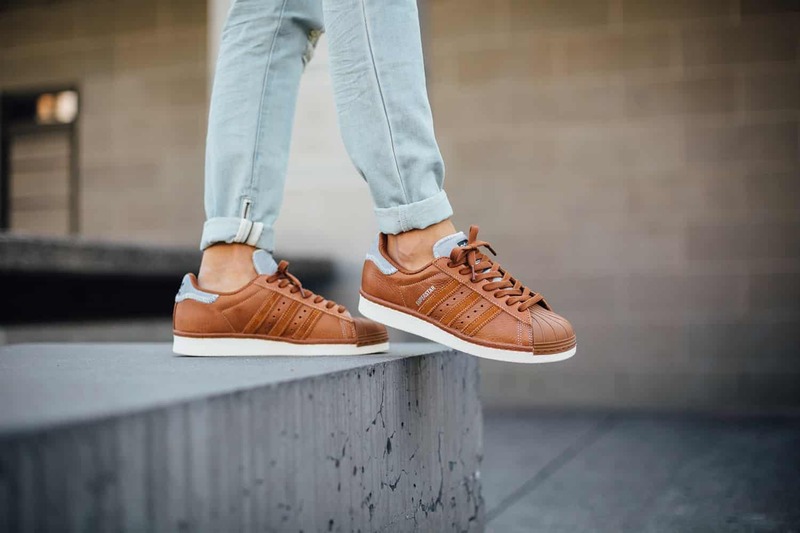 After a few futuristic releases it was time for adidas to get back to its vintage roots with the release of the Suede Classics. 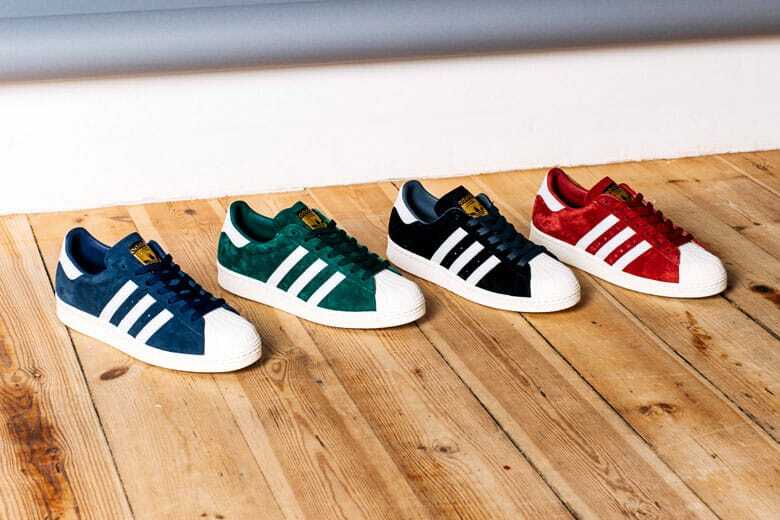 The pack consisted of a blue, green, black or red suede upper with white toe, stripes and soles. Skateboarding icons Kareem Campbell, Joey Bast, Drake Jones and Richard Angelides were asked by adidas to help design clothing and shoes as part of their “Respect Your Roots” Pack. The result was 4 different versions including a suede high top as well as 3 further pairs. adidas paid tribute in the latest “City” pack by producing a suede upper in a different colour for each city - New York, Paris, London, Berlin, Shanghai and Tokyo. The respective colours were grey, black, red, blue, violet and yellow. In anticipation of the 2015 festival season adidas continued to release a number of different colourways as part of its festival canvas pack. 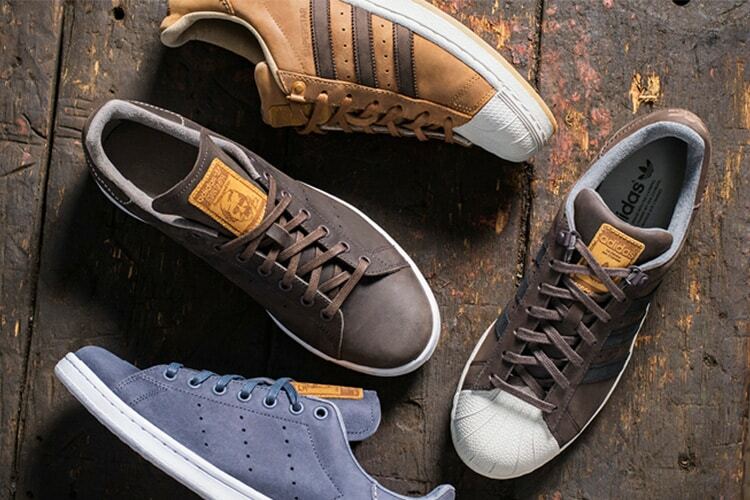 6 colourways to be exact, all on a fresh cotton canvas with traditional white shell-toe. We love an OG and this release was no exception. There were 3 original colourways with this release, red stripes on white, black stripes on white and white stripes on navy blue. A beautiful throwback of a classic. 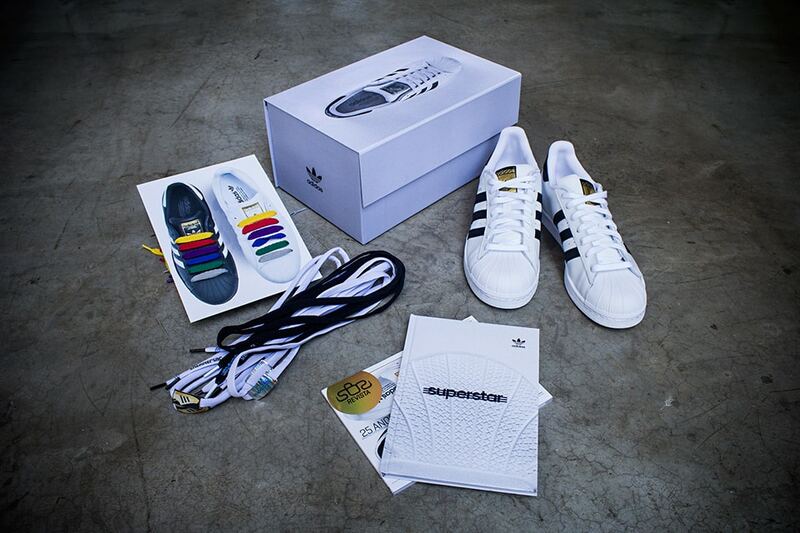 SneakersBR and adidas originals came together to celebrate 45 years of the Superstar by releasing this special pack. 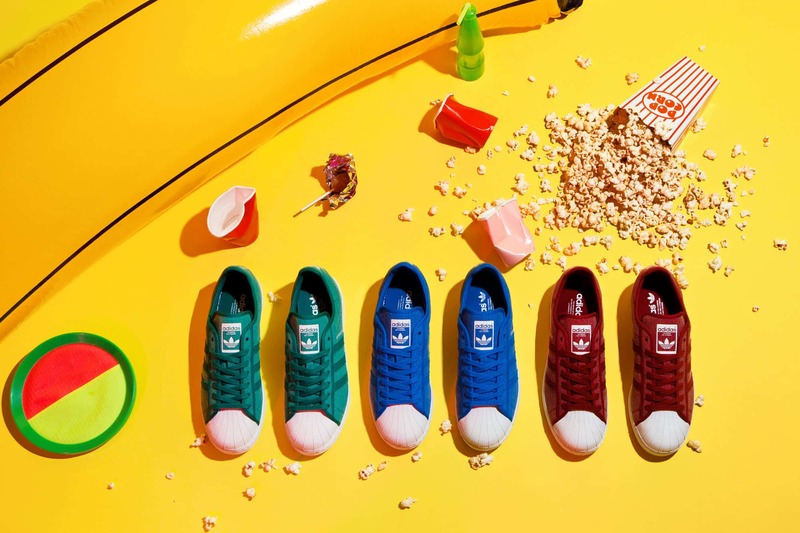 The collections consisted of a copy of SneakersBR magazine, 16 sets of color, SneakersBR-branded laces, stickers and a blank pair of adidas Superstars. 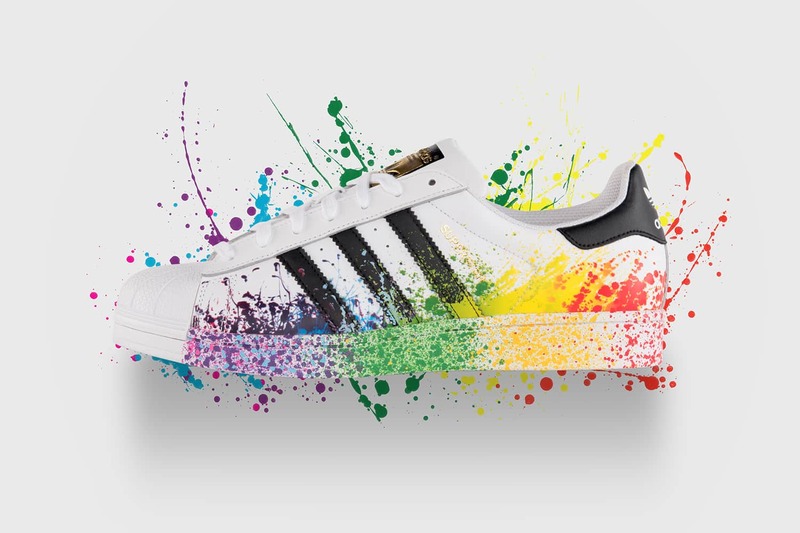 To celebrate LGBT pride adidas originals released the “pride” pack that consisted of the Superstar, Stan Smith and the Adilette. Each design featuring the colours from the rainbow LGBT flag. Mid 2015 saw the first time the primeknit came to the Superstar 80s. The innovative technology meets vintage style with this classic colourway of white upper with black stripes. This is the first release from the adidas Graphic Pack. This camo version is exactly what the name suggests with a full camouflage in traditional colours throughout the whole shoe - including the iconic toe. 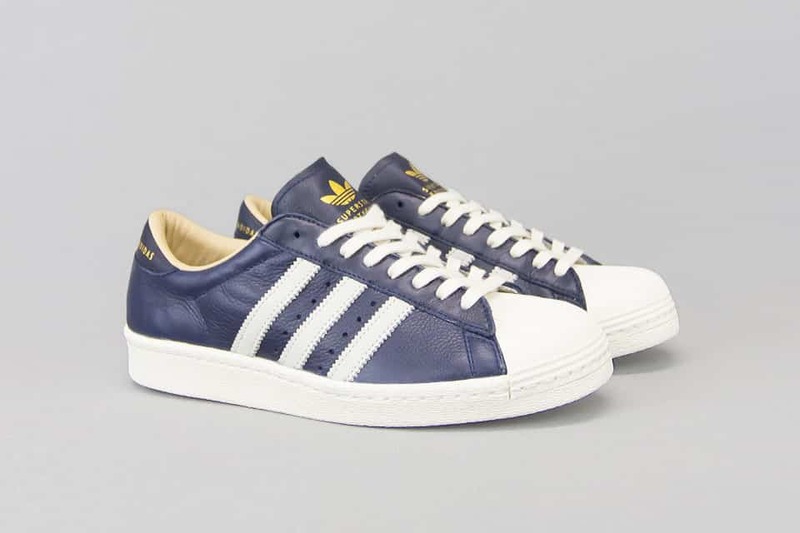 Unreleased on main sale but well worth mentioning here is the Superstar 80s with wooden toes. The shoe was released by store Afew in collaboration with designer Ivan Beslic. 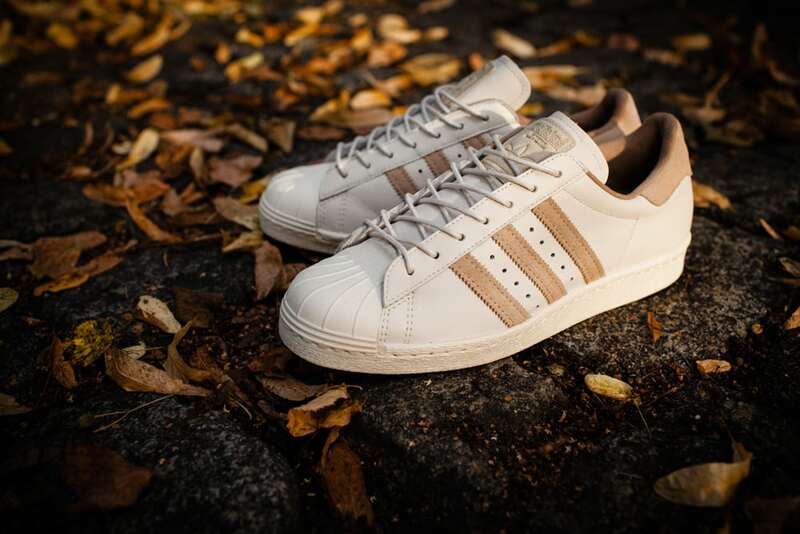 This really is a premium Superstar with the use of the finest leather and of course a real wooden toe. 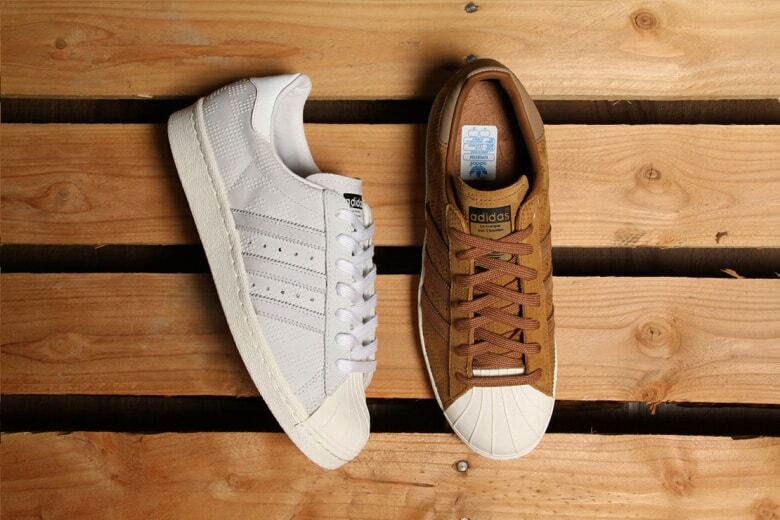 The Superstar Varsity Pack was a stunning leather shoe that came in either brown or black. There were silver touches on the heel and tongue. The Superstars were next up in the series of Star Wars releases. This time the shoe featured various designs, all linked to the different characters. The release featured mi adidas customization. We have seen a wooden toe and a metallic toe but this release was a little bit different due to the ruffled premium leather that was used on the upper. 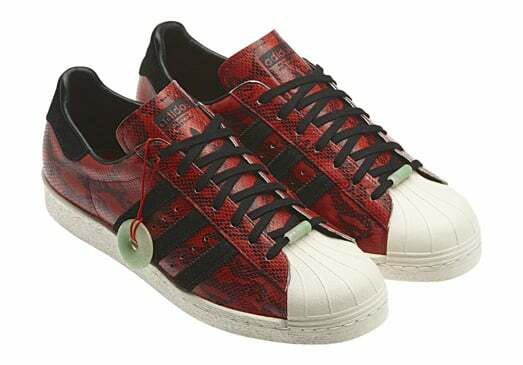 A follow-on from the Superstar 80s mentioned earlier NIGO and adidas once again collaborated. This time using the same logo backdrop but with a different red colourway and different logos. 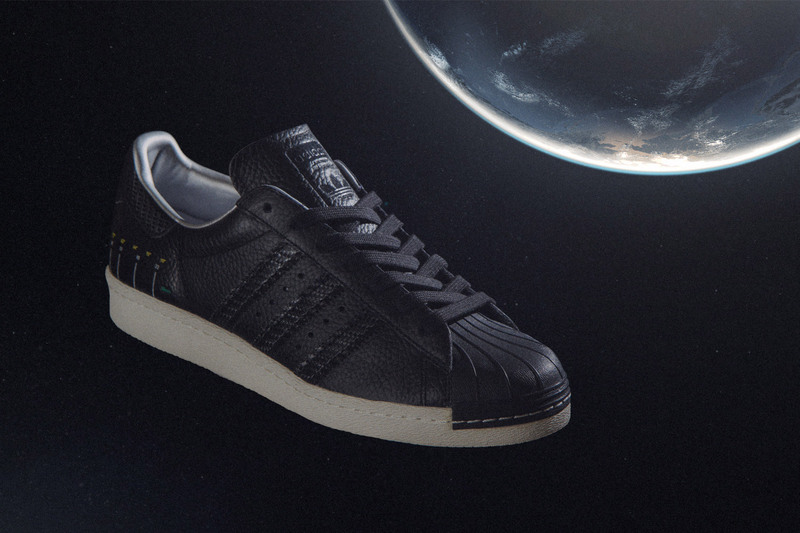 The Swedish Satellite Pack featured the Stan Smith, Tubular Runner and of course the Superstar. The idea behind this pack was to honour astronaut Michael Collins who in 1966 misplaced a camera while in space. 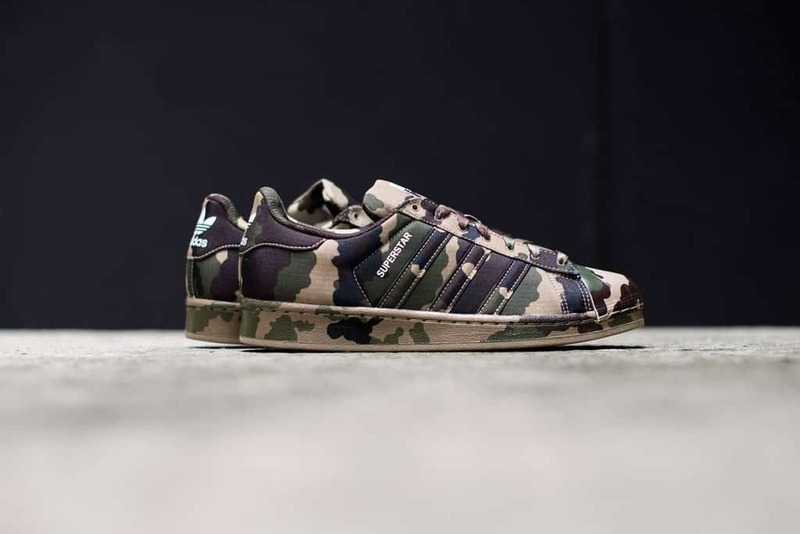 In mid 2015 the BAPE/UNDFTD team got together again with adidas originals to offer other colours to the already released Superstar 80s. This time the colours of choice were black and the other blue. 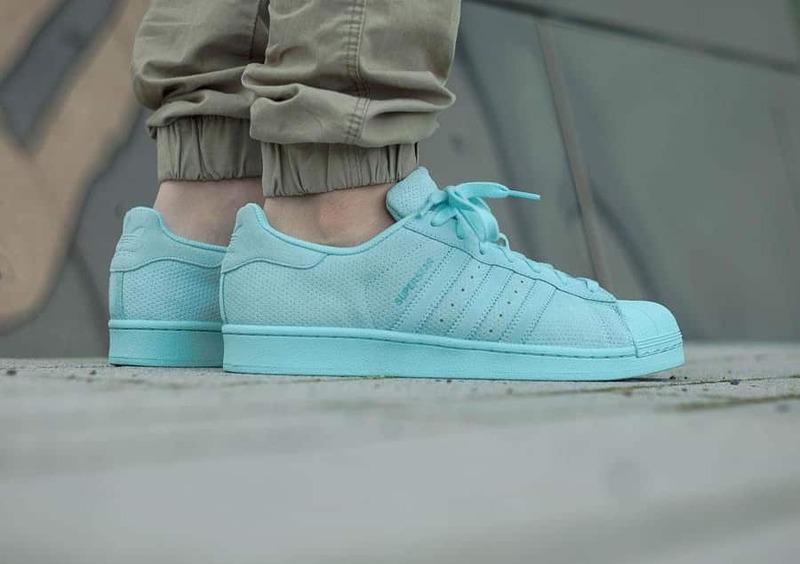 The “Perf” Pack of Superstars offered a perforated leather in a choice of either indigo, red or aqua. Unlike other similar summer designs the perf was released in Winter 2015. I guess there was a lot of soggy socks that year. If you have a pair of these Consortium releases then you are very lucky. These were a limited edition release that were individually numbered on the heel tab. The actual shoe was suede and even featured a suede toe. This is the first time Invincible and the adidas Consortium had teamed up and the certainly didn’t let us down. The collaboration was to mark the 10th year anniversary of the adidas consortium. The shoe itself took inspiration from Taiwan's cultures as can be seen clearly on the shoe. Another adidas Consortium design to celebrate their 10th anniversary and this time they team up with Limited Edt. 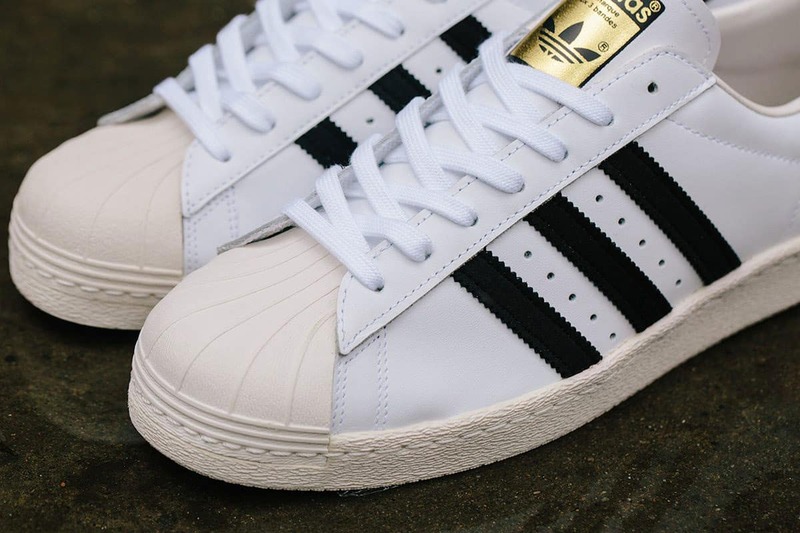 This premium release Superstar 80v uses premium leather upper and a metallic shell-toe. A stunning shoe. Building on their first release above INVINCIBLE and adidas Consortium use their first design and give it a new colourway. 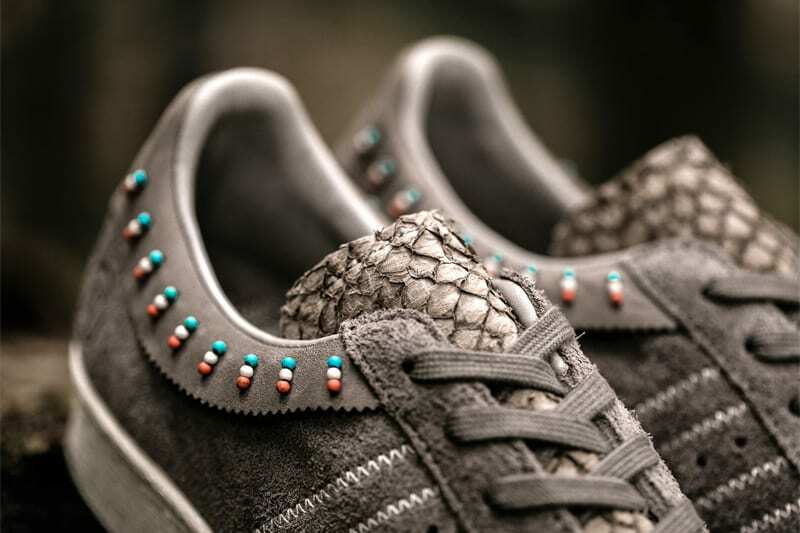 This time they offered the beaded delight in a premium black leather. 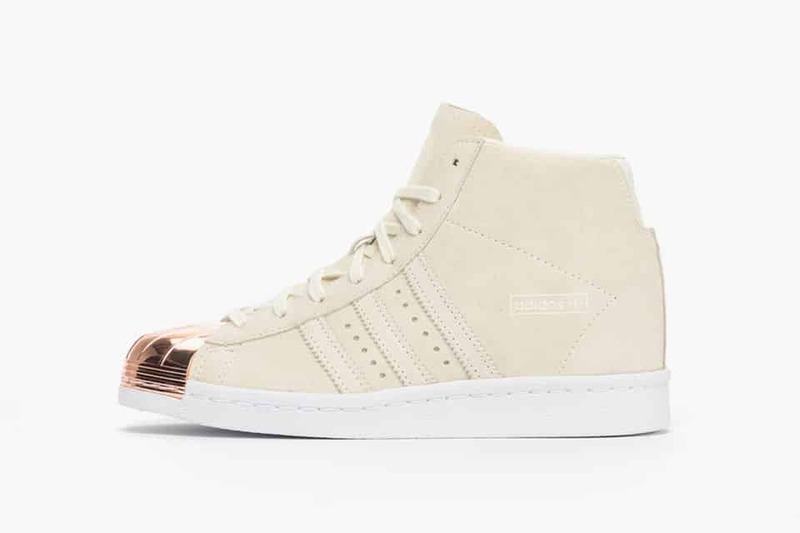 Nothing new with adidas revealing a copper toe but what was new was the use of the copper toe on a pair of Superstar 80s High. With a contrasting cream leather upper this shoe will certainly stand out but unless you are good at cleaning, they might not stay like that for too long. 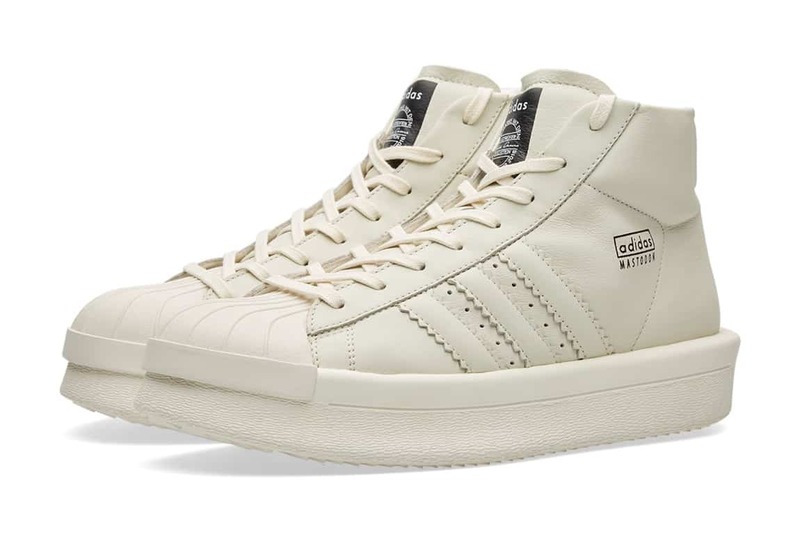 Going back to the roots of Superstar colours this “Clean” design came with the deluxe leather in a bright white with iconic cream rubber toe and sole. Staying on the same traditional look adidas offered further originality in early 2016 with the DLX Pack. 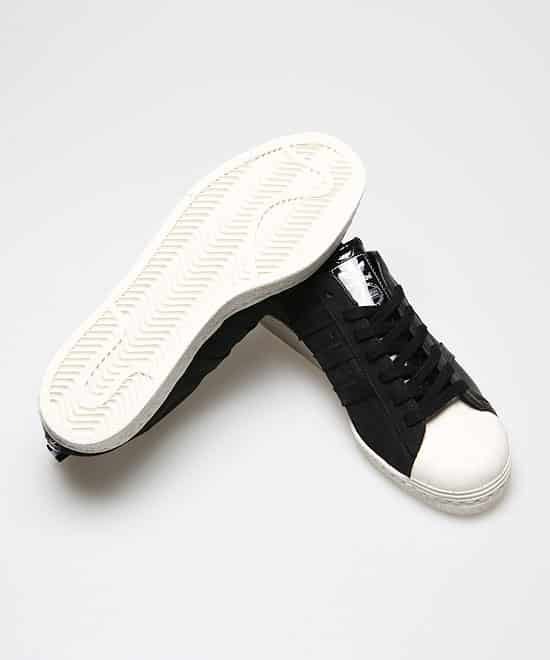 It offered a leather upper in either white or black with contrasting white/black stripes and a cream toe and sole. 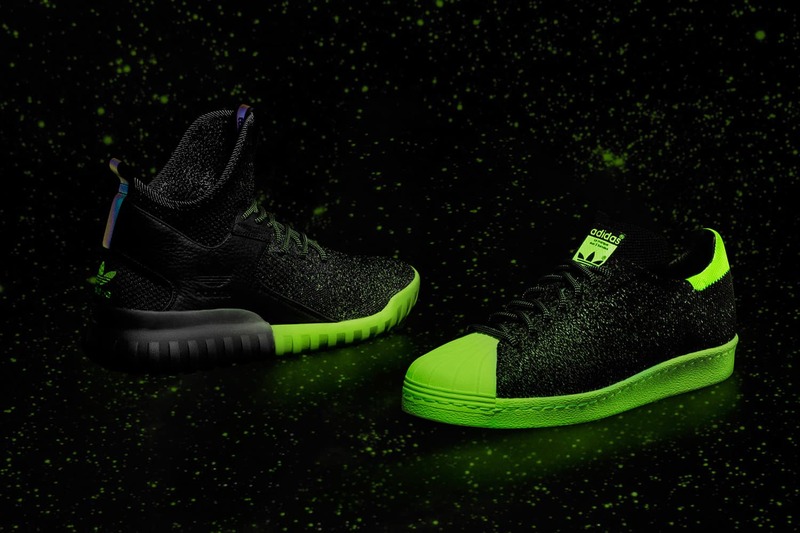 In celebration of the 2016 NBA All-Star Weekend in Toronto adidas released the glow in the dark primeknit. This was 2 pieces of innovation coming together on one shoe and the result was pretty spectacular. 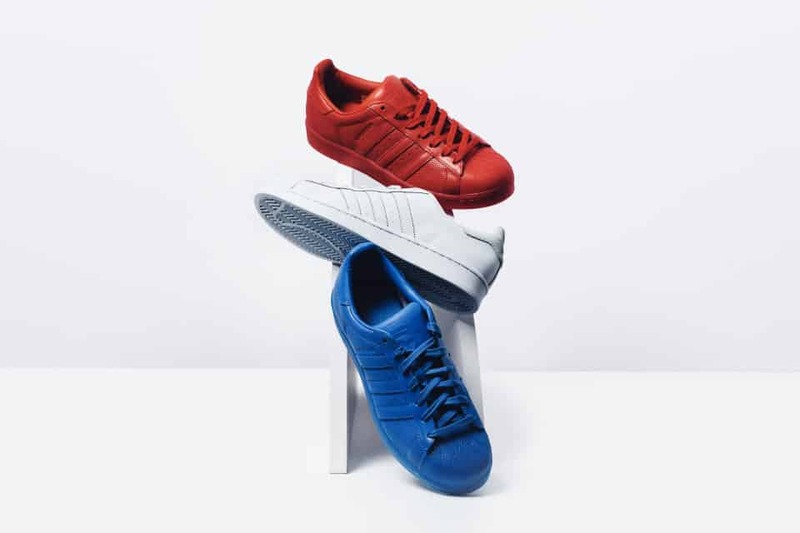 As part of its adicolor collection adidas released 3 colors the blue, red and halo blue. Each shoe had a perforated leather upper and the color covered the whole of the shoe. 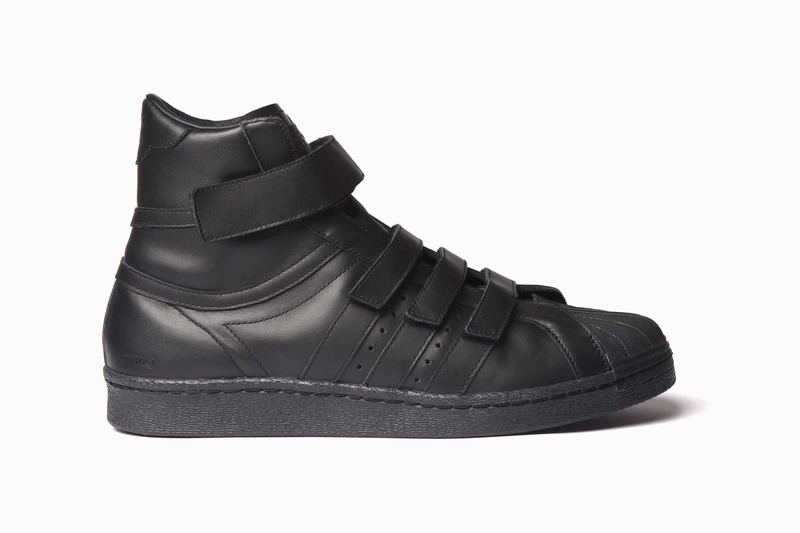 We have seen some crazy designs over the years as showcased on this page but when the Rick Owens take on the Superstar was released to the world, I think everyone took a step back. 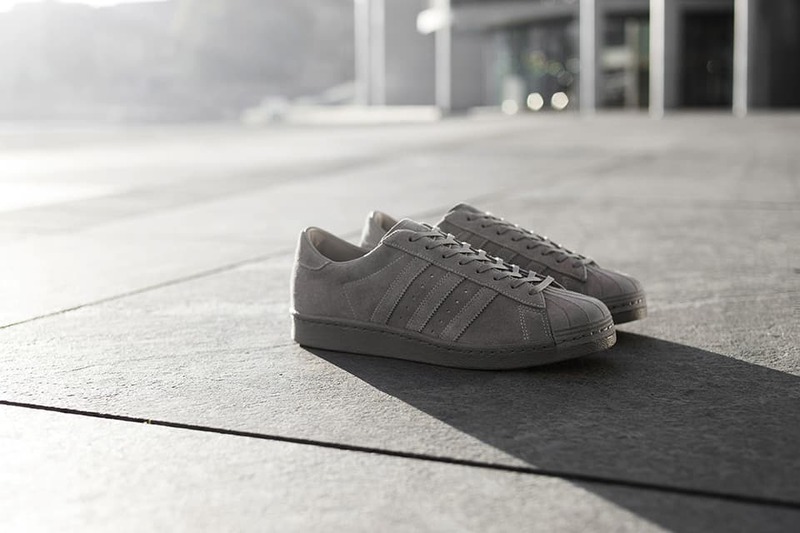 It is basically a full suede boot with the iconic Superstar outer sole and infamous shell-toe. 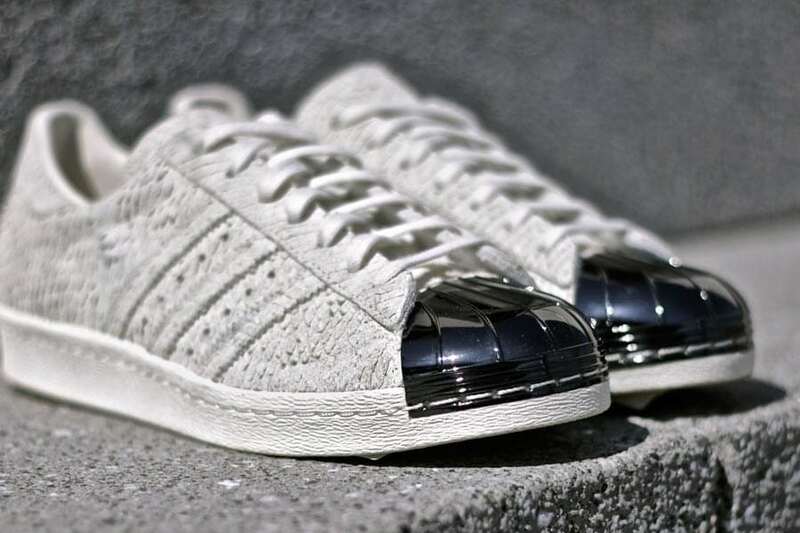 BEAUTY & YOUTH and adidas collaborate on the Superstar once again with this release. 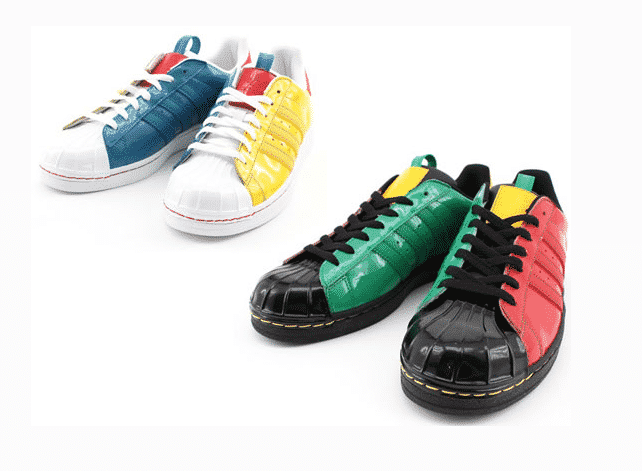 This time the Japanese retailer opted for a tradional look with a white leather upper, white sole, white toe and laces. In fact the only part of the shoe that wasn’t white was the blue heel tab. For Summer 2016 adidas turned to the Superstar to apply their primeknit technology. The result was a very fresh summery pair of Superstar 80s in Luscious Red. The Triaxial print is a kind of geometrical print that adidas added in black to the underlay of this pair of Superstars. The toe and sole were all black with contrasting white stripes and heel tab. Adidas teamed up with DJ Clark Kent and Russ Bengtson for this ‘Quickstrike Pack’ Bengtson and Kent host the Quickstrike sneaker video series on Complex. The Quickstrike Pack includes a Superstar low and a pro model. 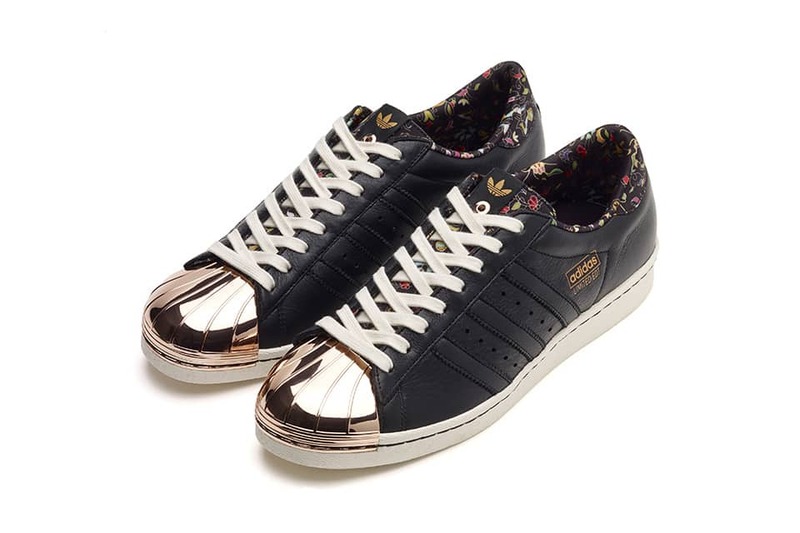 This premium womens Superstar is made from a sliced nubuck which has been overlaid with an embossed snakeskin print. This is a simple design and has all the elements as a traditional classic. As part of its BNY Sole Series, Barneys teamed up with adidas again to this time to release their take on the Stan Smith and the Superstar. The result was a beautiful clean modern design. Unique stitching give this pair is own distinctive look which is quite hard to do when there has been so many different versions of the Superstar over the years. One of the advantages of the primeknit construction is that many different colors can be woven together to create exciting patterns. 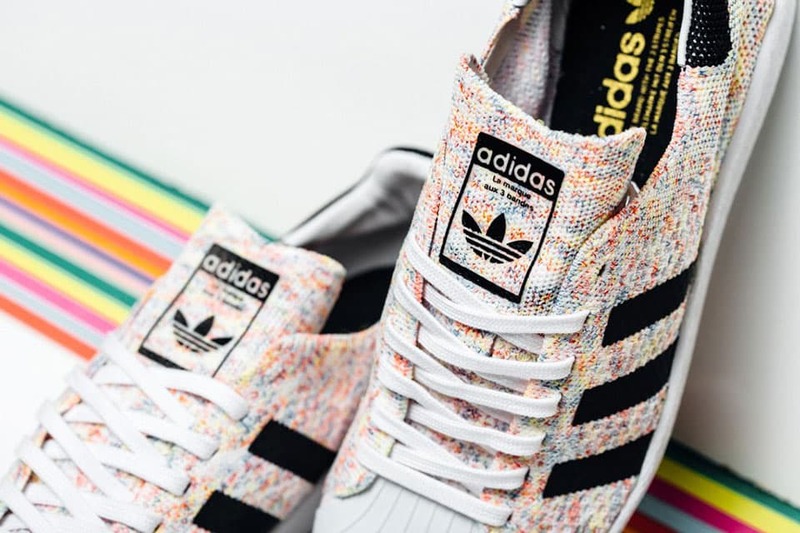 This is exactly what adidas did with the multicolor primeknit. The upper uses a rainbow of colors to give a fresh summer look for summer 2016. 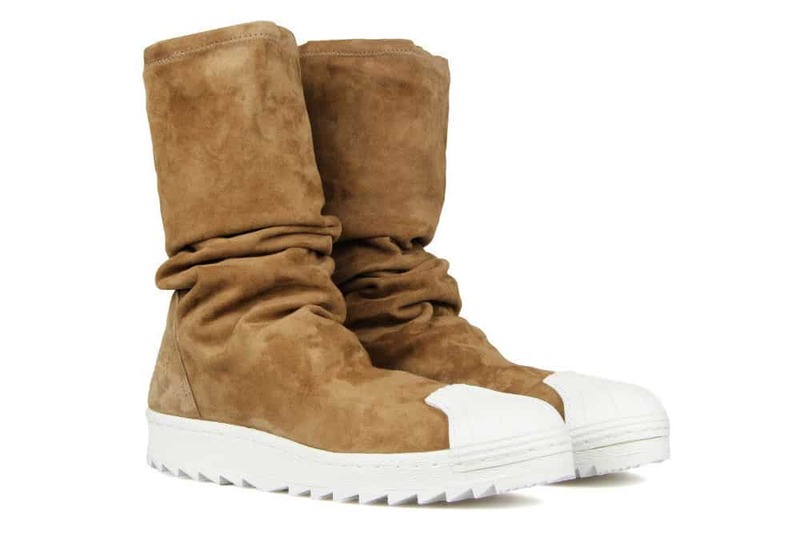 If you noticed the Rick Owens Superstar boot above then you probably won’t be surprised to see this follow up release by Rick Owens. The main feature of these boots is without doubt the chunky midsoles. Of course adidas were going to release a special shoe for the 2016 Olympics, after all the Olympics and adidas have a special bond. 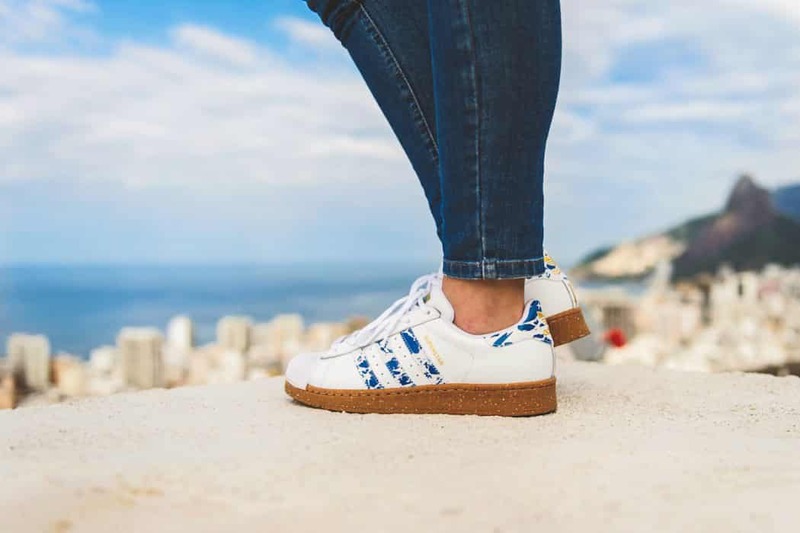 To celebrate the cultures of Brazil adidas called up the following experts to help design a special shoe - photographer Fernando Schlaepfer, cultural producer Gessica Justin, designer and sneakerhead Hayala Garcia, and creative director Marcela Ceribelli. Adidas and Kasina turn back to traditional style and values with this slick, clean design. Nearly the whole shoe is constructed from premium cream suede. A black heel tab and black stripe stitching give this shoe a beautiful modern/retro feel. At the end of 2016 adidas teamed up with Footlocker Europe to release the Master Craft pack. This pack includes the NMD, LA, Stan Smith, Hardcourt and of course the Superstar. A special pack of adidas’ most popular shoes. 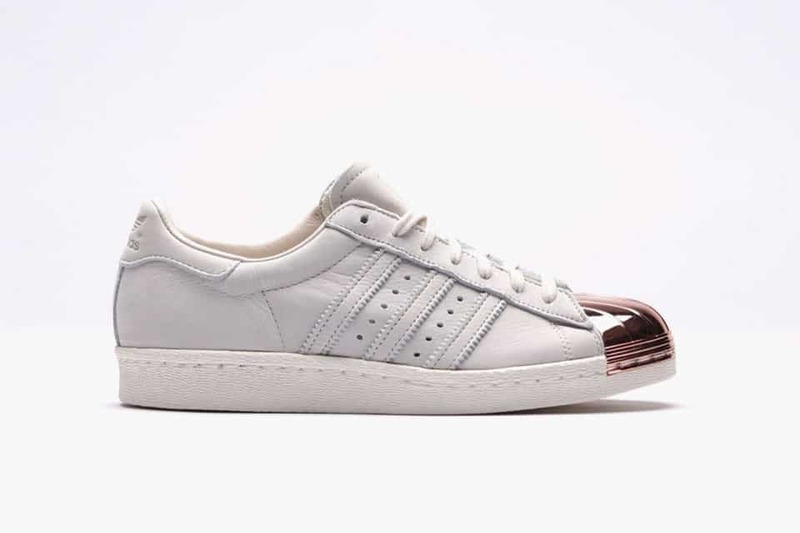 Not for the first time the Superstar featured a metal toe cap with this pack and was offered in two colorways - a light grey ostrich leather upper with silver metallic toecap and black ostrich leather with rose gold toecap. The metal toecap might not be unique but it certainly is timeless. To celebrate Offsprings 20th anniversary the retailer is recreated some of the adidas classics and added their own twist. 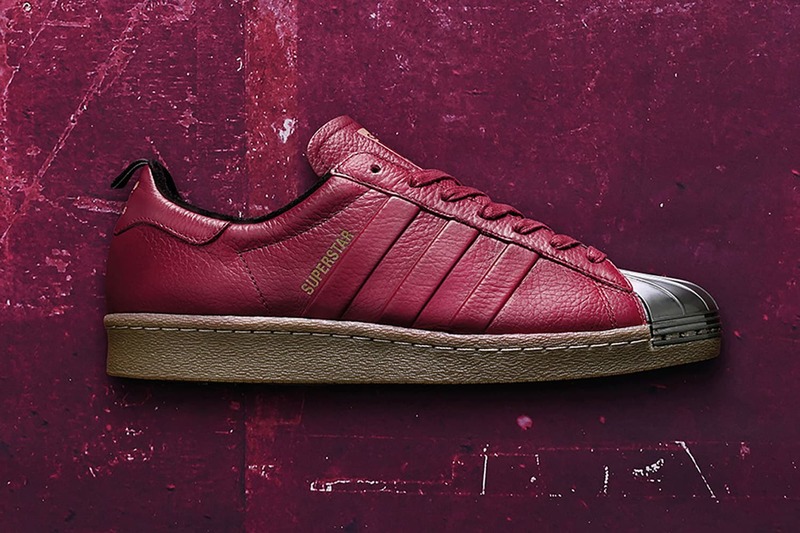 For the Superstar they used a unique gunmetal material for the upper which was offered in a maroon like colorway. 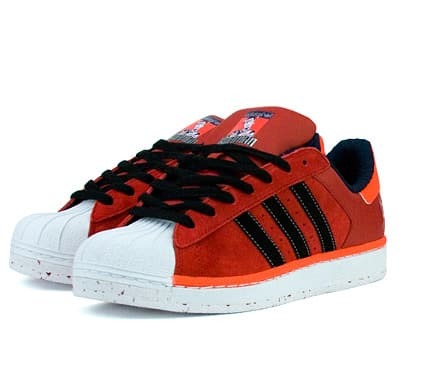 In 2006 adidas launched the NBA edition of the adidas Superstar and created a design for each team in the NBA. Even the materials that were used were slightly different on each design. For example The Memphis Grizzlies used a clear 3 stripes over a prominent Grizzlies logo whilst the Hornets opted for a more subtle design with a use of suede leather. The NBA series wont be stocked in many retailers now so you best bet to find a pair will be ebay. 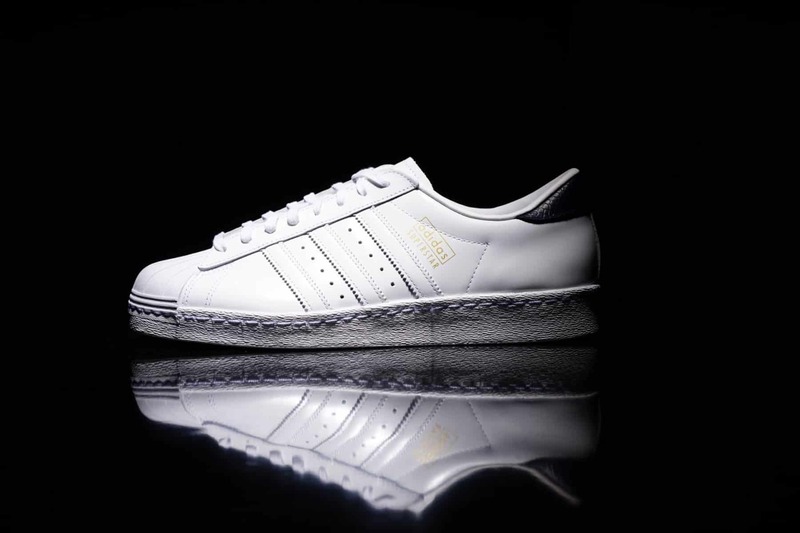 In 2004 adidas released the eagerly anticipated 35th Anniversary Edition of the Superstar. This special series consisted of 5 different groups and 35 different designs in total. 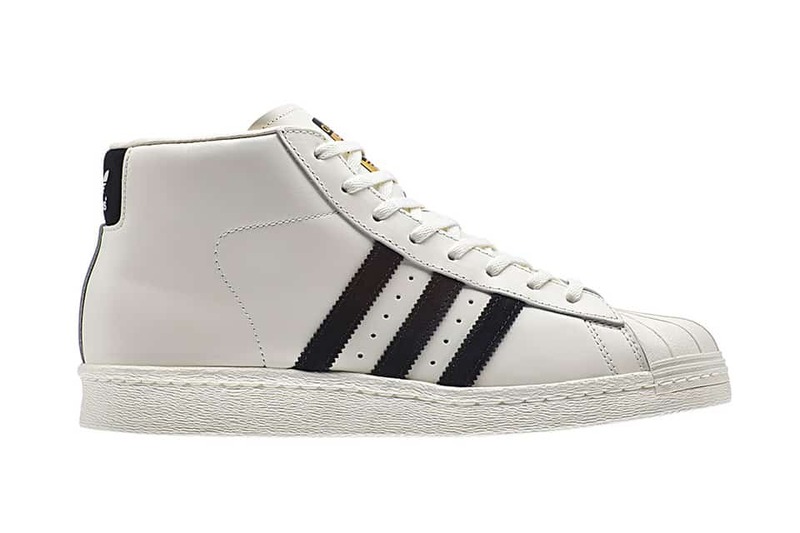 There haven’t been too many noticeable changes in the different versions of the adidas Superstars over its career. 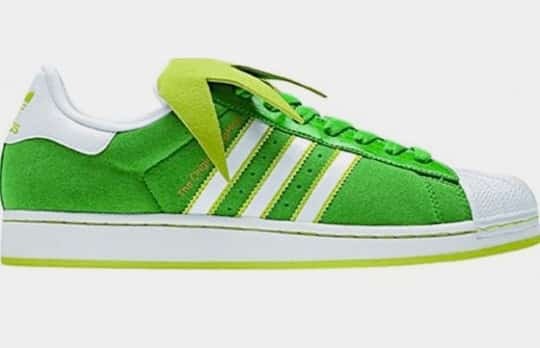 When the the Superstar 1 was launched adidas added a trefoil to the back heel support and removed the “Superstar” writing on the side of the shoe. 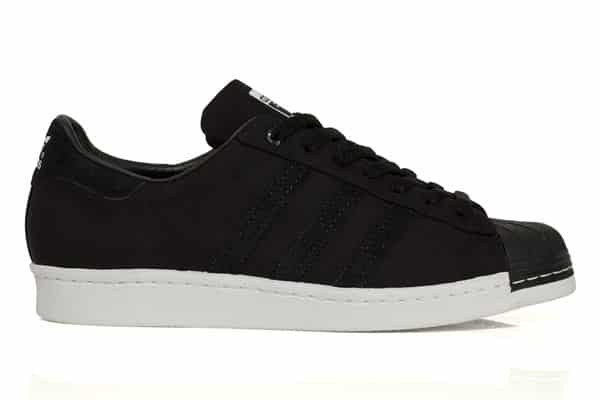 The trainer then stayed the same until the adidas Superstar 2 was released. The main difference of the adidas Superstar 2 was a fatter tongue so urban fashion gurus could copy that infamous Run-DMC style. adidas achieved this by adding more padding than the previous thin felt like tongue of earlier models. The Superstar 2 has seen a range of limited edition models released recently and is probably the most common edition of the moment. 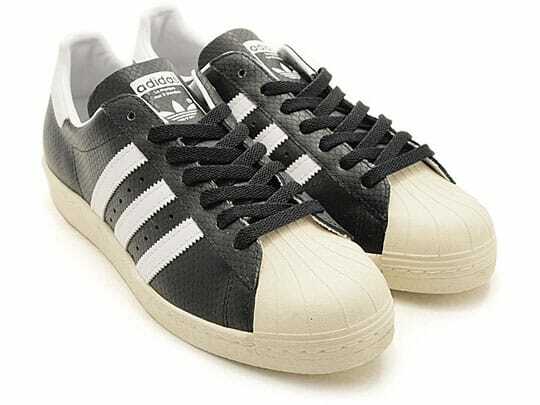 The adidas Superstar trainer was first released in 1969 and offered a lower top design than the existing Pro Model. The Superstar was designed with basketball in mind and consisted of some key characteristics that are still evident in the modern releases. The most famous of these characteristics was the shell toe which was added to the shoe simply to protect the player's toes during competitive basketball games. Shell Toes became a popular nickname of the shoe and many don't even know the trainer's real name. The all leather uppers were used to provide extra comfort and support whilst the non-marking soles became the basketball courts best friend. One of the first basketballers in the NBA to wear the adidas Superstars was basketball legend Kareem Abdul-Jabaar. Prior to wearing this state of the art super shoe Kareen and the other NBA players of that time were wearing a floppy canvas shoe. It didn’t take long for the adidas superstar trainer to become the shoe of choice for a reported 75% of players in the NBA at that time. “I played in them the whole time and I think that shoe worked for me, it didn’t need to be improved on.” - Kareen Abdul-Jabaar"
In the 80s a huge turn of events happened around the adidas Superstar which not only catapulted the shoe into greatness but also laid the foundations for adidas to become a world leader in street fashion and extend its popularity beyond just sportswear. Run DMC were pivotal in this transition. The rap group out of Queens started wearing the shoe on the street and at concerts. It wasn’t long before the Superstar was embraced into HipHop and urban culture. 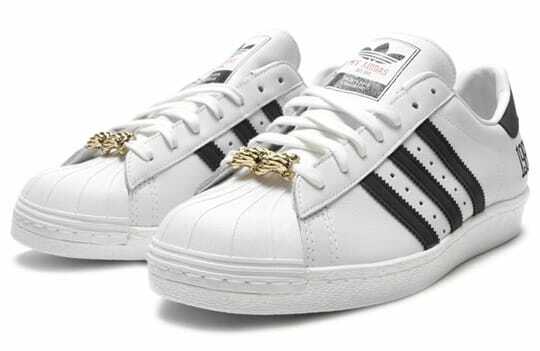 The bigger Run-DMC became the bigger the adidas Superstar sneaker became and the trend was soon spread globally. Run-DMC even had their own way of wearing the trainer with the laces really loose and the tongue pulled out. Its surprising that adidas was not endorsing Run-DMC at this stage and they weren’t even behind the song My adidas that they released 1986. It did however set the wheels in motion for a reported $1.6 million contract between the 2 parties a couple of years later. 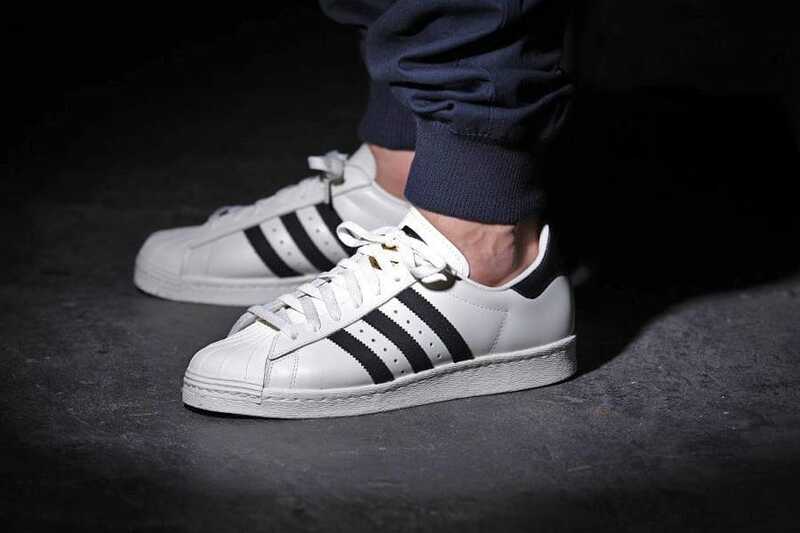 A number of well known celebrities have been papped wearing the iconic adidas Superstar. The obvious celebrities are those that have been signed by adidas like Pharrell Williams, Rita Ora and Kanye West. But celeb Superstar wearing doesn’t stop there and they can often be found on a number of fashion shoots. Pharrell is the latest big name celebrity to sign up to adidas and he certainly isn’t hiding from his responsibilities. As adidas go all out to crush nike Pharrell’s popular endorsement is doing no harm to the reputation of the brand. 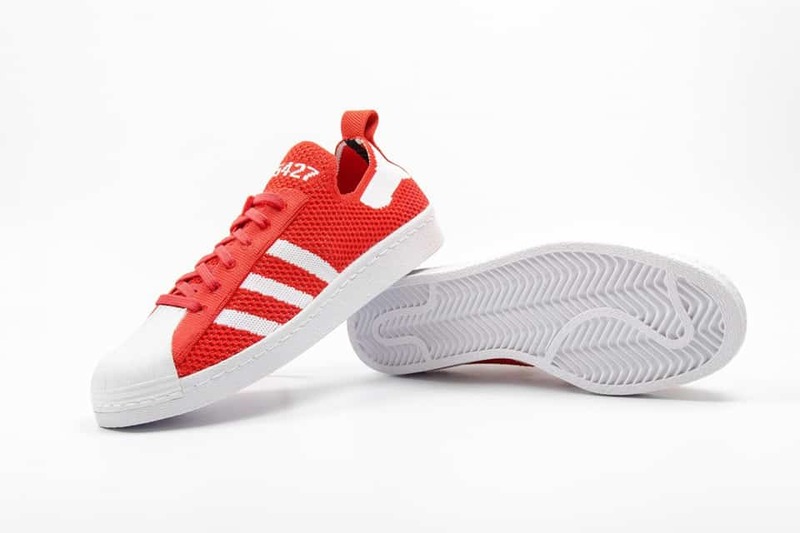 The adidas Superstar is one of the Iconic adidas shoes that Pharrell is eager to to put his spin on. In 2014 he was pictured on the adidas Originals Instagram feed surrounded in about 50 pairs of different coloured Superstars. 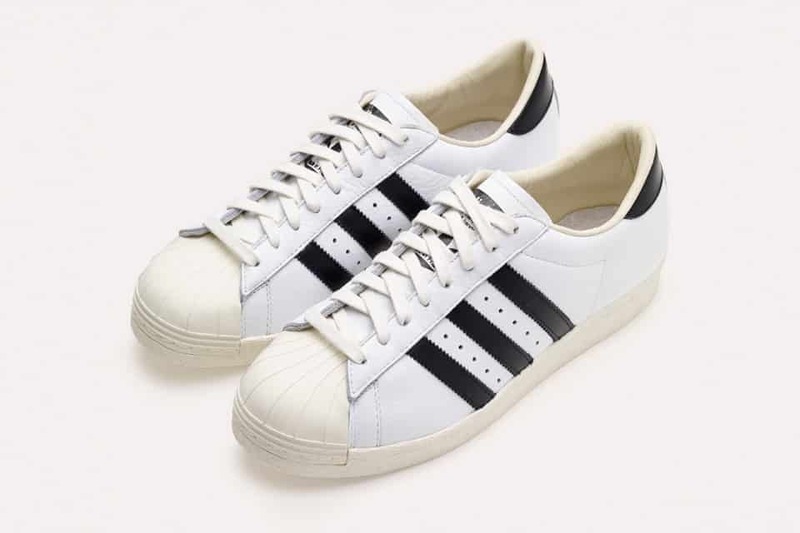 adidas Superstar Kids trainers have increased in popularity over the last 20 years. Stylish parents love to see their little toddlers dancing around in a classic pair of Superstar Juniors. Not all adult designs make it to the little ones shelf but this doesn’t mean kids dont have much choice. adidas is constantly bringing out new kid designs and when feet grow as fasts as childrens then adidas know there will always be a demand. The most noticeable difference between a kids shoe and an adults other than the size is the use a velcro fasteners to make sure putting them on and off is as painless as possible. 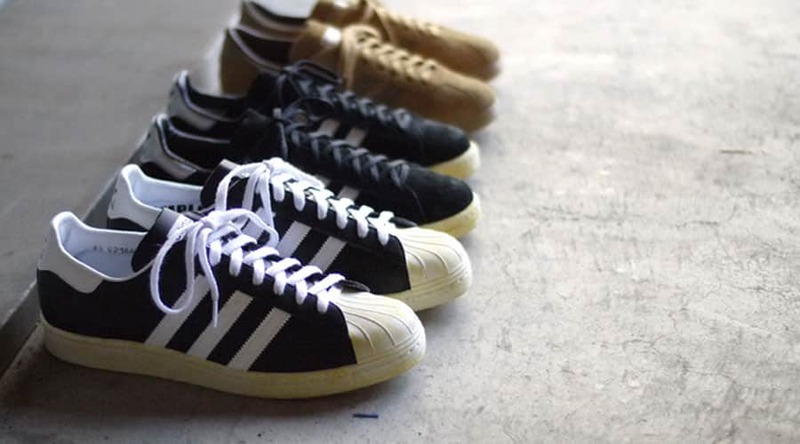 Love Vintage adidas is a community for those of us who love the adidas 3 stripes both past and present.